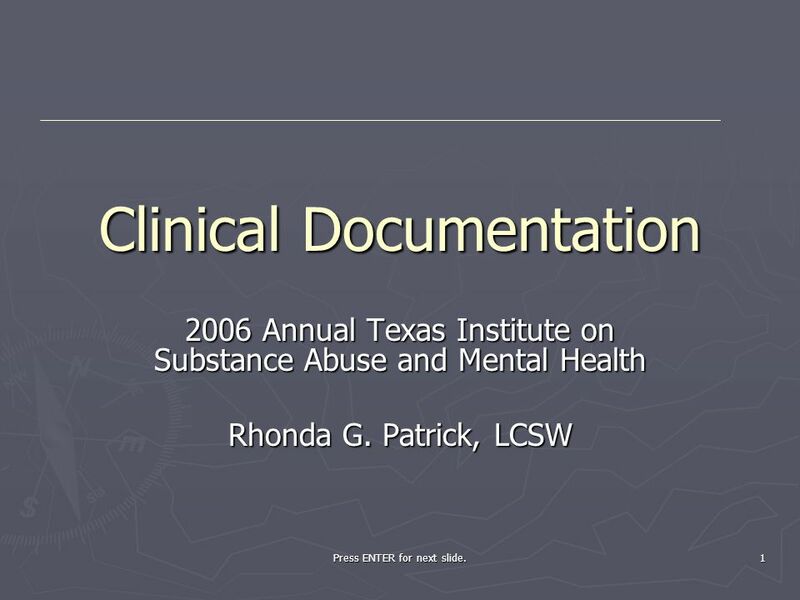 2006 Annual Texas Institute on Substance Abuse and Mental Health Rhonda G. Patrick, LCSW Press ENTER for next slide. Press ENTER for next slide. 3 Press ENTER for next slide. ASSESSMENT Press ENTER for next slide. 4 Press ENTER for next slide. 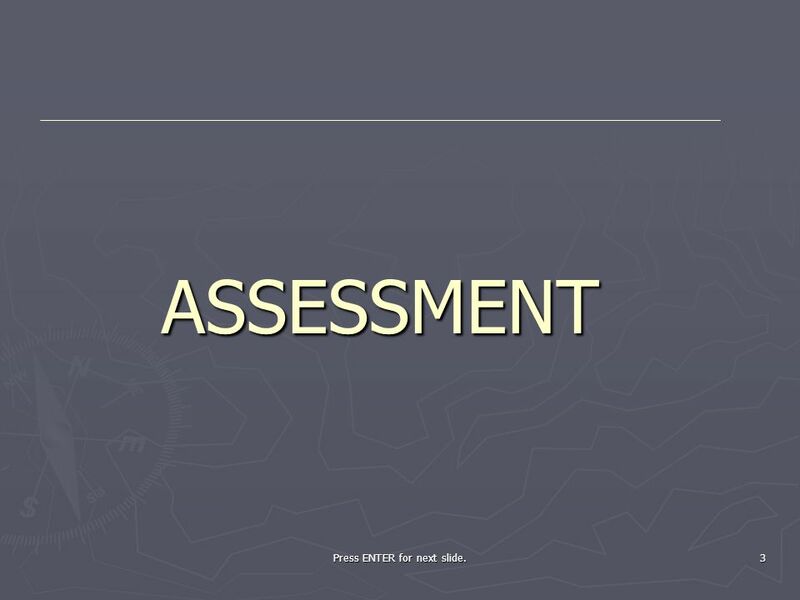 What is the assessment? 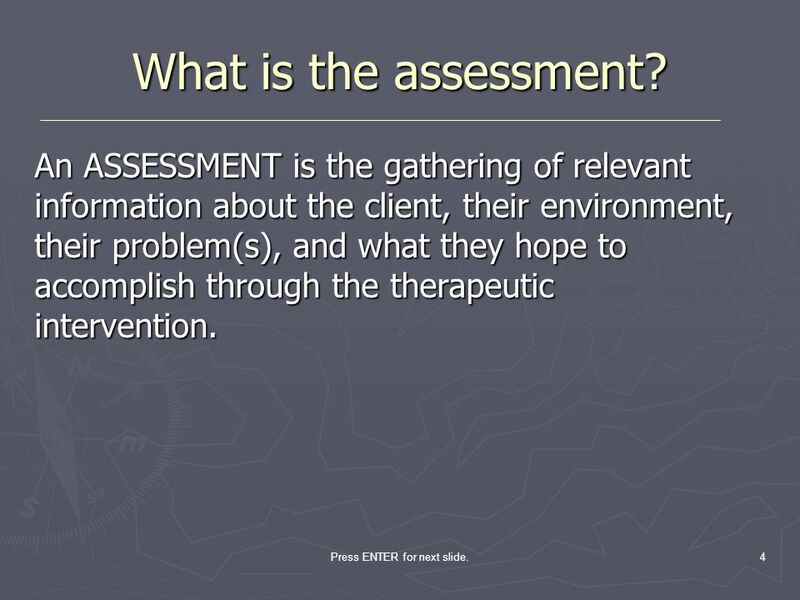 An ASSESSMENT is the gathering of relevant information about the client, their environment, their problem(s), and what they hope to accomplish through the therapeutic intervention. Press ENTER for next slide. 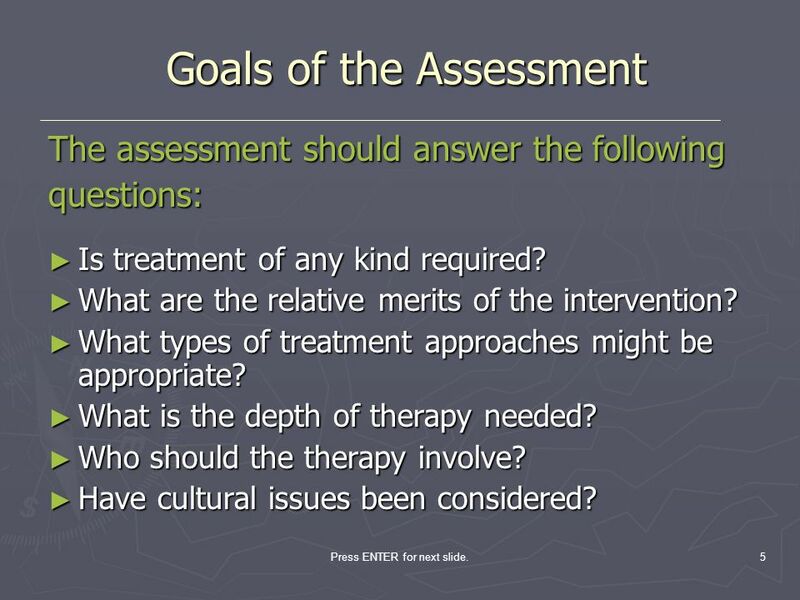 The assessment should answer the following questions: Is treatment of any kind required? What are the relative merits of the intervention? What types of treatment approaches might be appropriate? What is the depth of therapy needed? Who should the therapy involve? Have cultural issues been considered? The assessment should enable both the client and Clinician to answer the following questions: Is treatment of any kind required? 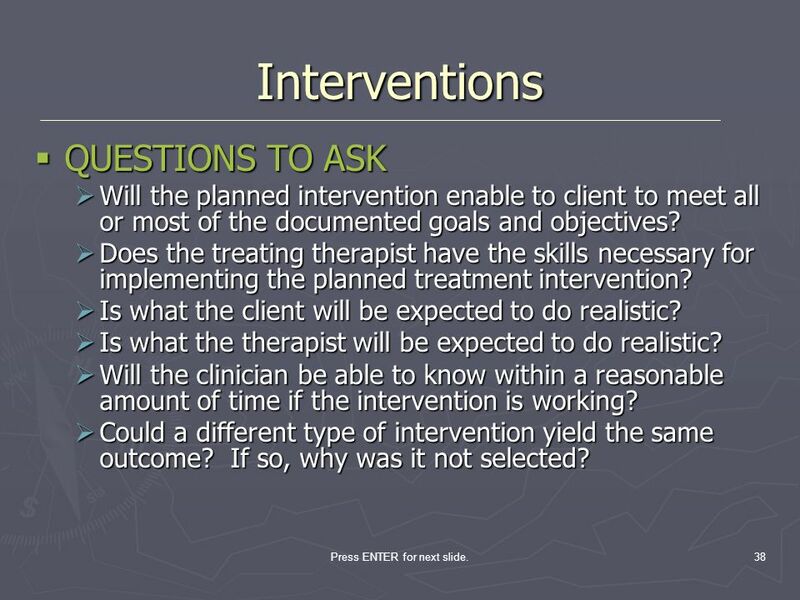 If treatment is indicated, what are the relative merits of the intervention? What types of treatment approaches might be appropriate? What is the depth of therapy needed? Who should the therapy involve? Have cultural issues been considered? Press ENTER for next slide. 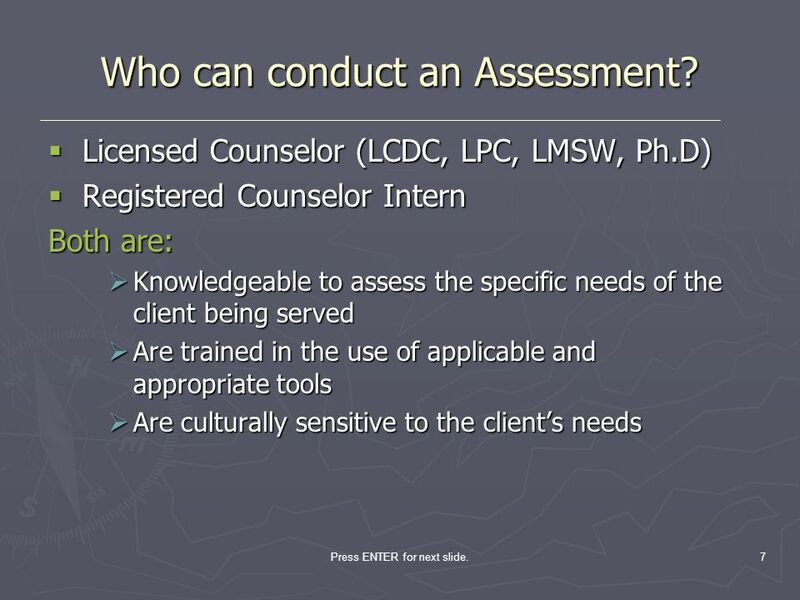 The Assessment should answer these basic Questions: Why is the client seeking treatment? How have these problems affected the client’s life? What is maintaining these problems? What does the client hope to gain from treatment? 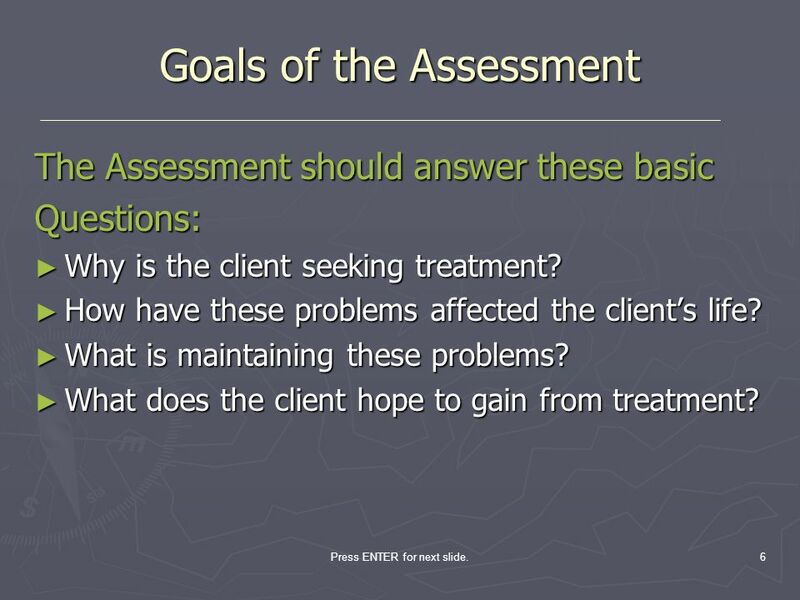 The Assessment should answer these basic Questions: For what problems is the client seeking treatment? How have these problems affected the client’s life? What is maintaining these problems? What does the client hope to gain from treatment? Press ENTER for next slide. 7 Who can conduct an Assessment? Licensed Counselor (LCDC, LPC, LMSW, Ph.D) Registered Counselor Intern Both are: Knowledgeable to assess the specific needs of the client being served Are trained in the use of applicable and appropriate tools Are culturally sensitive to the client’s needs Licensed Counselor (LCDC, LPC, LMSW, Ph.D) Registered Counselor Intern Both are: Knowledgeable to assess the specific needs of the client being served Are trained in the use of applicable and appropriate tools Are culturally sensitive to the client’s needs Press ENTER for next slide. Presenting Problem or Chief Complaint Alcohol and Other Drug Use History (use) Family and Social/Leisure History (activities) Educational/Employment History (training) Legal History Mental Health History (mental/emotional functioning) Medical History (HIV, STD, TB, HEP) Client Strengths and Limitations Recommendations Presenting Problem or Chief Complaint Alcohol and Other Drug Use History (use) Family and Social/Leisure History (activities) Educational/Employment History (training) Legal History Mental Health History (mental/emotional functioning) Medical History (HIV, STD, TB, HEP) Client Strengths and Limitations Recommendations Press ENTER for next slide. 9 Press ENTER for next slide. Presenting Problem Asks the client: What brings you here today? Why do you think you need treatment? The answers provide immediate insight into what the client considers the most pressing problem and provides clues as to how distressing these problems are. If the client is entering treatment voluntarily, information relating to how motivated the client is for treatment, and their expectations for treatment can also be obtained. client responses to these questions should be recorded verbatim. Press ENTER for next slide. 10 Press ENTER for next slide. Alcohol and Drug Use Substances used in the past Substances used recently Frequency/amount/duration Route of administration Year or Age of first use Behavior related to obtaining substances Use or recovering from alcohol or other drugs Previous overdose, withdrawal, or adverse drug or alcohol reactions Attempts to decrease/stop use History of previous substance abuse treatment received Substances used in the past, including prescribed drugs. Substances used recently, especially those used within the last 48 hours. Frequency of use, amount of use, duration of use and route of administration. Year or Age of first use of each substance. Behavior related to obtaining, use or recovering from alcohol or other drugs. Previous occurrences of overdose, withdrawal, or adverse drug or alcohol reactions. 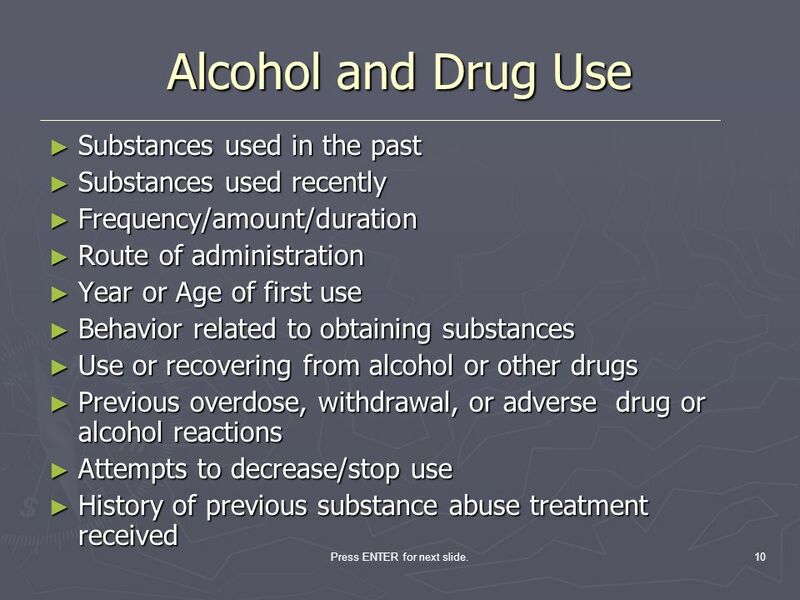 Attempts to decrease/stop use any history of previous substance abuse treatment received. Press ENTER for next slide. The family history should include: The occupation and education of patents The number of siblings and their birth order The quality of clients relationship to parents and or siblings Significant extended family members Parental approach to child rearing Familial expectations for the client Helps you understand how the client got to this point through a familial context. 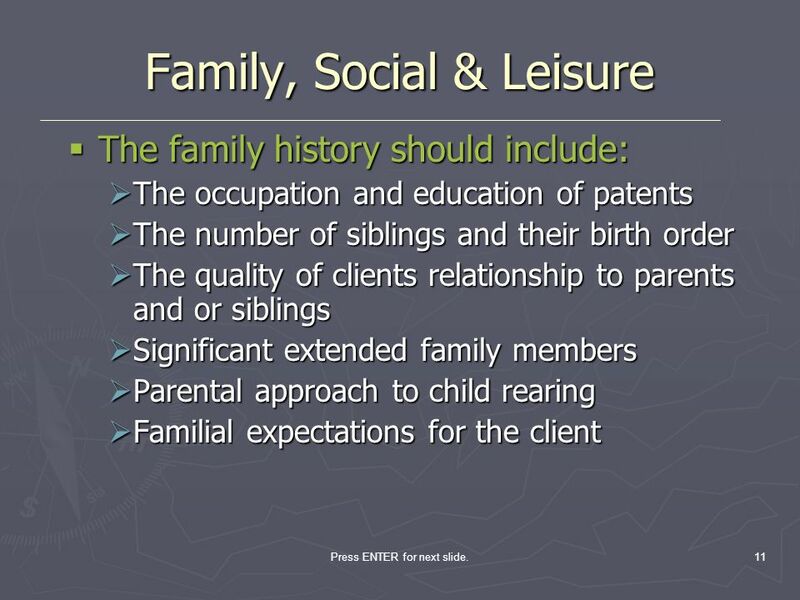 Important aspects of the family history include: The occupation and education of patents, The number of siblings and their birth order, The quality of clients relationship to parents and or siblings Significant extended family members, Parental approach to child rearing, Familial expectations for the client. Press ENTER for next slide. 12 Press ENTER for next slide. 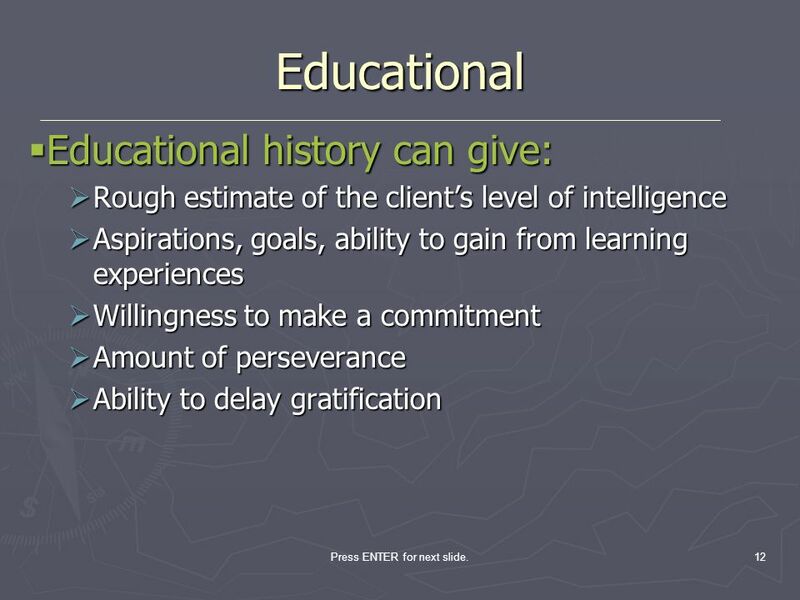 Educational Educational history can give: Rough estimate of the client’s level of intelligence Aspirations, goals, ability to gain from learning experiences Willingness to make a commitment Amount of perseverance Ability to delay gratification This generally provides limited yet potentially important information. The attained level of education can give you an rough estimate of the client’s level of intelligence. It also speaks to the client’s aspirations, goals, ability to gain from learning experiences, their willingness to make a commitment, their amount of perseverance, and their ability to delay gratification. Press ENTER for next slide. 13 Press ENTER for next slide. 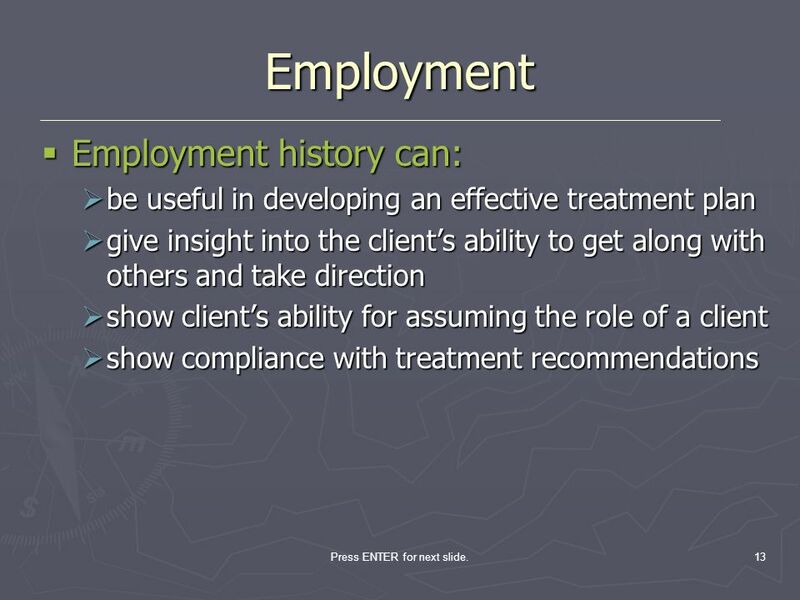 Employment Employment history can: be useful in developing an effective treatment plan give insight into the client’s ability to get along with others and take direction show client’s ability for assuming the role of a client show compliance with treatment recommendations This can provide you with a wealth of information that can be useful in understanding the client and developing an effective treatment plan. Interactions with supervisors and peers can provide you with insights into the client’s ability to get along with others and take direction. In addition, the client’s ability to assume and meet the expectations of being a hired employee may have implications for assuming the role of a client and complying with treatment recommendations. Press ENTER for next slide. 14 Press ENTER for next slide. 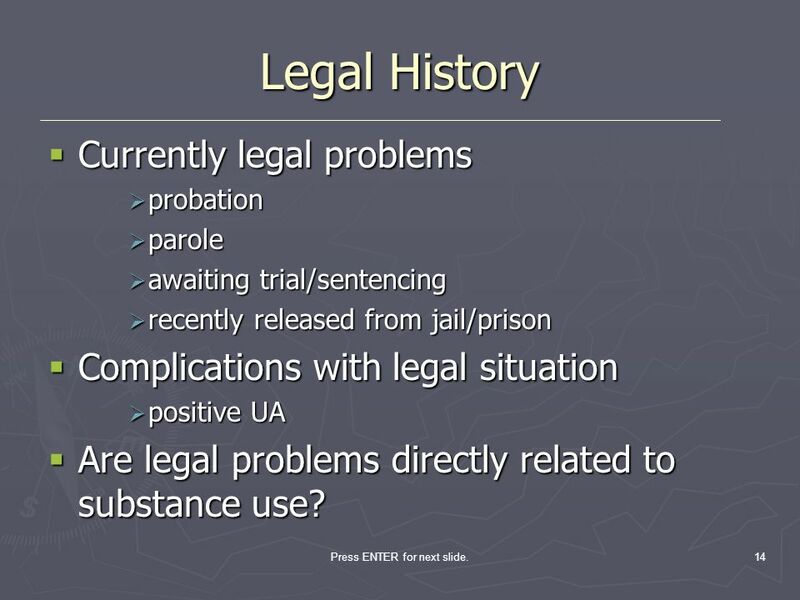 Legal History Currently legal problems probation parole awaiting trial/sentencing recently released from jail/prison Complications with legal situation positive UA Are legal problems directly related to substance use? Is the client currently experiencing any legal problems (probation, parole, awaiting trial/sentencing, recently released from jail/prison). Complications with legal situation (positive UA) Is legal problems directly related to substance use? Press ENTER for next slide. 15 Press ENTER for next slide. Mental Health History Can shed light on whether the current problem is part of a single or recurrent episode. A progression of behavioral health problems over a period of time. What treatment approaches have or have not worked. Client’s willingness to engage in the treatment process. Get an idea of current emotional functioning. 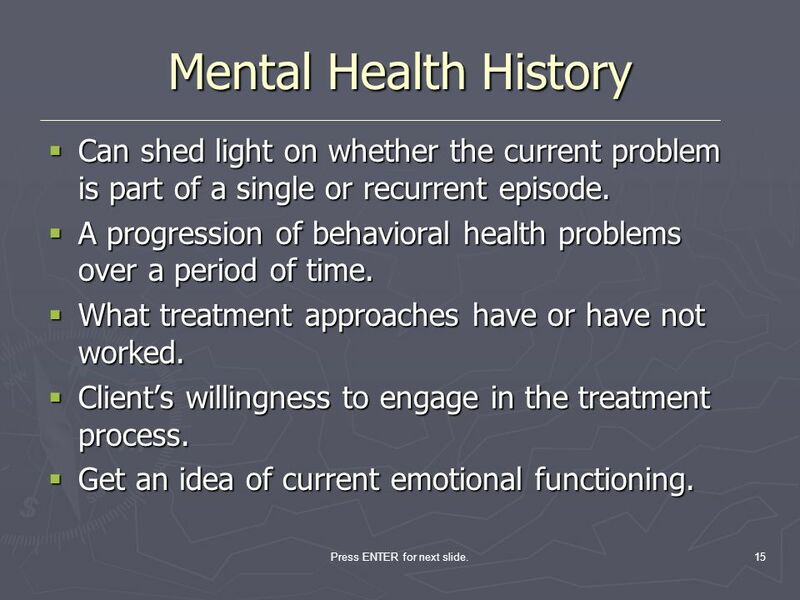 A previous history of behavioral health problems and treatment is important to know. This should be documented regardless of the level of care. Obtaining this information can shed light on whether the current problem is part of a single or recurrent episode, or a progression of behavioral health problems over a period of time, what treatment approaches have or have not worked in the past, and the client’s willingness to engage in the treatment process. Important to get an idea of current emotional functioning, especially with youth. Press ENTER for next slide. 16 Press ENTER for next slide. 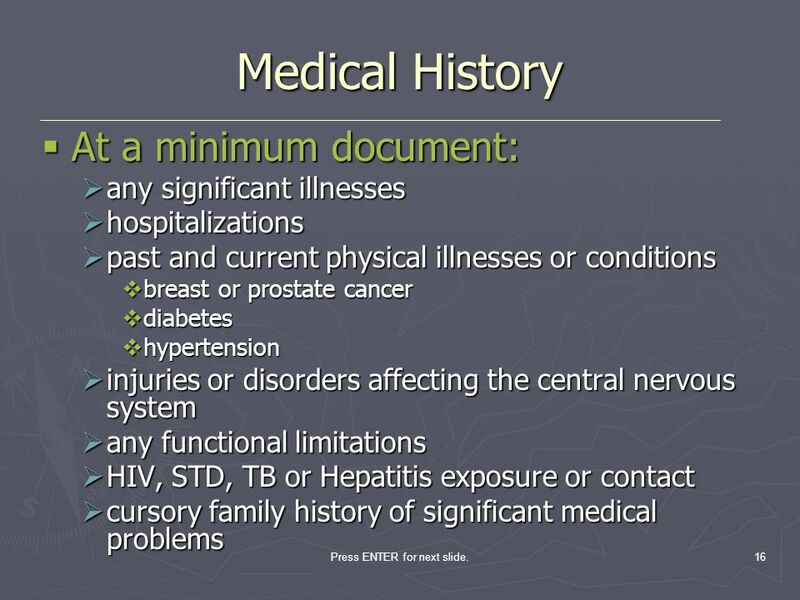 Medical History At a minimum document: any significant illnesses hospitalizations past and current physical illnesses or conditions breast or prostate cancer diabetes hypertension injuries or disorders affecting the central nervous system any functional limitations HIV, STD, TB or Hepatitis exposure or contact cursory family history of significant medical problems At a minimum, you should document any significant illnesses, hospitalizations, past and current physical illnesses or conditions (i.e., breast or prostate cancer, diabetes, hypertension), injuries or disorders affecting the central nervous system, any functional limitations. HIV, STD, TB or Hepatitis exposure or contact. You should include a cursory family history of significant medical problems. Press ENTER for next slide. 17 Press ENTER for next slide. 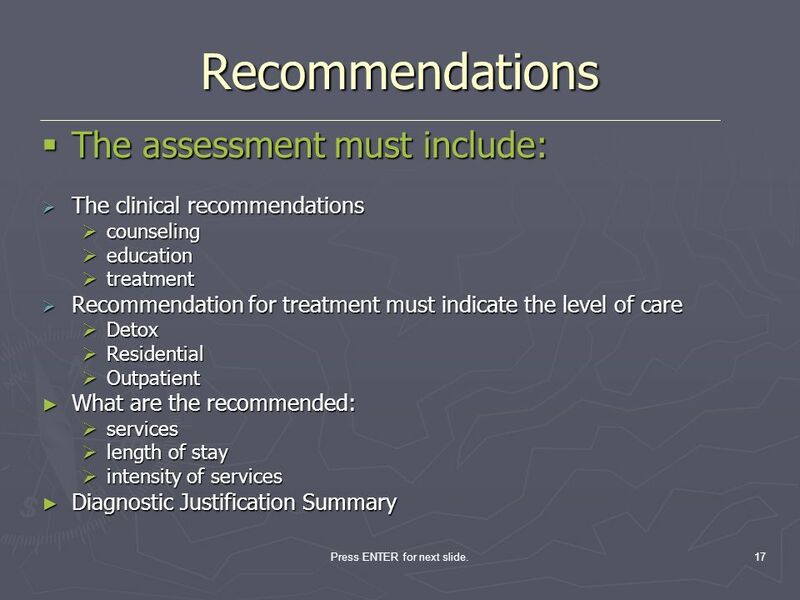 Recommendations The assessment must include: The clinical recommendations counseling education treatment Recommendation for treatment must indicate the level of care Detox Residential Outpatient What are the recommended: services length of stay intensity of services Diagnostic Justification Summary After your assessment, what are your clinical recommendations. Nothing, other counseling, education, treatment. If recommendation is for treatment what is the level of care (Detox, Residential, Outpatient) What are the recommended services, length of stay and intensity of services. Diagnostic Justification Summary Press ENTER for next slide. Axis I (Clinical Disorders, other conditions that may be a focus of attention) Examples: Substance abuse, substance dependence, anxiety disorders, mood disorders, schizophrenia Axis II (Personality disorders, mental retardation) Examples: Borderline personality disorder, antisocial personality disorder, avoidant personality disorder, mental retardation Axis III (General medical conditions) Examples: Cancer, Hypertension, Diabetes, Migraines, Chronic Pain, Injuries Axis IV (Psychosocial and environmental problems) Examples: Problems with primary support group, occupational problems, problems relating to social environment Axis V (Global assessment of functioning) Example: GAF Score Axis I (Clinical Disorders, other conditions that may be a focus of attention) Examples: Substance abuse, substance dependence, anxiety disorders, mood disorders, schizophrenia An accurate diagnosis can have important implications in the development of an effective course of treatment. Axis II (Personality disorders, mental retardation) Examples: Borderline personality disorder, antisocial personality disorder, avoidant personality disorder, mental retardation Identification of a personality disorder on Axis II with or without an accompanying Axis I disorder would have a bearing on the projected length of treatment. 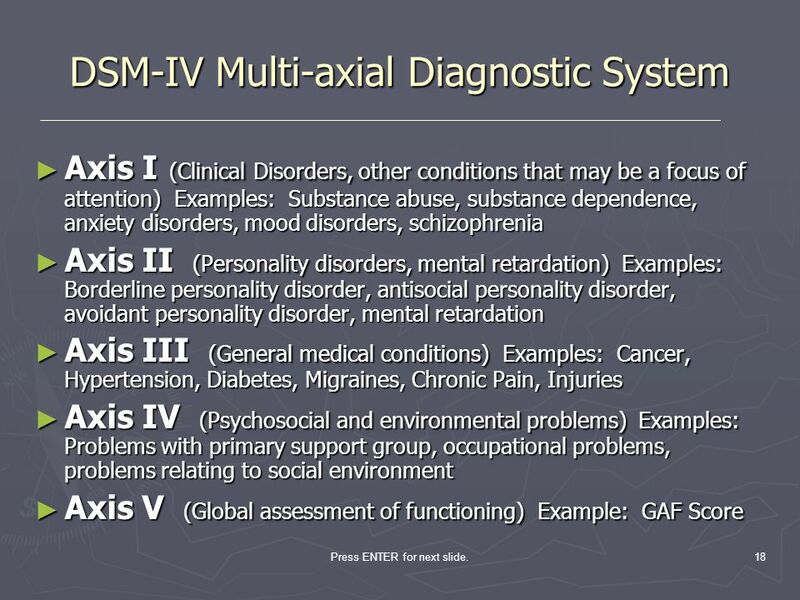 Axis III (General medical conditions) Examples: Cancer, Hypertension, Diabetes, Migraines, Chronic Pain, Injuries Axis IV (Psychosocial and environmental problems) Examples: Problems with primary support group, occupational problems, problems relating to social environment Axis V (Global assessment of functioning) Example: GAF Score Diagnoses are efficient tools for communicating among professionals and organizations. Press ENTER for next slide. 19 Press ENTER for next slide. 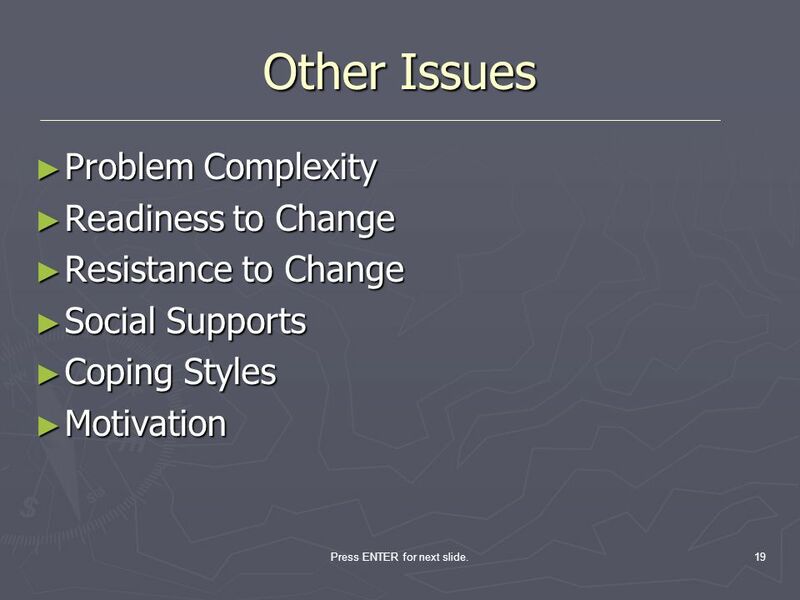 Other Issues Problem Complexity Readiness to Change Resistance to Change Social Supports Coping Styles Motivation Press ENTER for next slide. 20 Press ENTER for next slide. 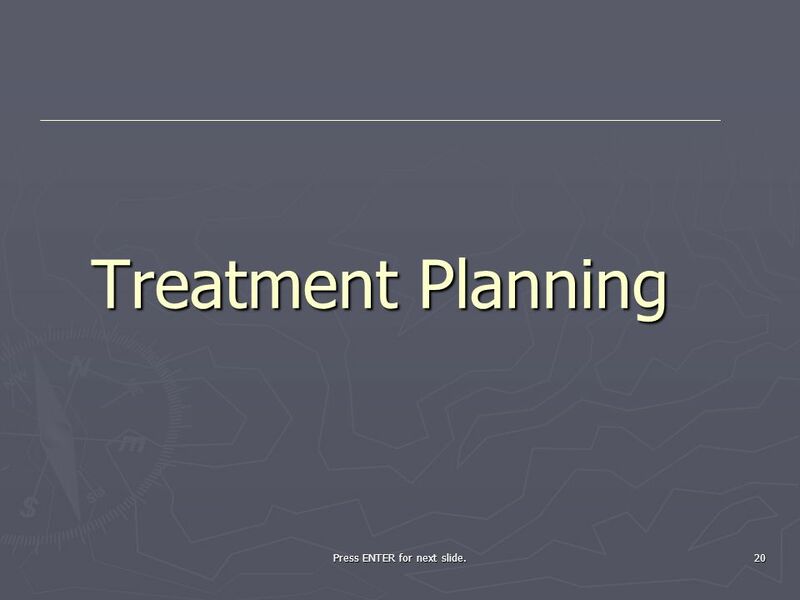 Treatment Planning Press ENTER for next slide. To clarify the treatment focus The set realistic expectations To establish a standard for measuring treatment progress The facilitate communication among professions (both Clinical and Support) To support treatment authorizations To document quality assurance efforts To clarify the treatment focus The set realistic expectations To establish a standard for measuring treatment progress The facilitate communication among professions (both Clinical and Support) To support treatment authorizations To document quality assurance efforts Press ENTER for next slide. Problem List Presenting Problem Goals Objectives Treatment Interventions Criteria for Discharge Problem List Presenting Problem Goals Objectives Treatment Interventions Criteria for Discharge Press ENTER for next slide. 24 Press ENTER for next slide. 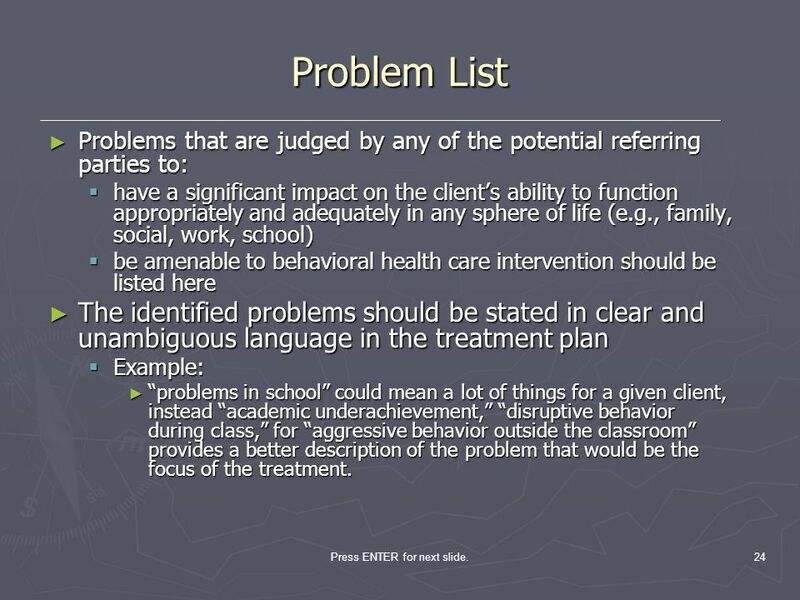 Problem List Problems that are judged by any of the potential referring parties to: have a significant impact on the client’s ability to function appropriately and adequately in any sphere of life (e.g., family, social, work, school) be amenable to behavioral health care intervention should be listed here The identified problems should be stated in clear and unambiguous language in the treatment plan Example: “problems in school” could mean a lot of things for a given client, instead “academic underachievement,” “disruptive behavior during class,” for “aggressive behavior outside the classroom” provides a better description of the problem that would be the focus of the treatment. Once the problem list is compiled, it then becomes important to verify that all of the problems (a) are understood and conveyed in clear language, (b) significantly impair the client’s ability to function in some important sphere of life, and (c) are amenable to therapeutic intervention. Regardless of the relative importance of other-identified problems, the clinician should always give special consideration to those problems identified by the client. This acknowledges their importance to the treatment planning process. It is important to remember that prioritizing problems is a collaborative effort between the clinician and the client, thus the clients involvement in this process is critical. A number of factors should be considered when prioritizing the final problem list: The degree and extent to which the problems impact the client’s life. The clinician should identify and determine which problems must be dealt with first in order to achieve a resolution of the problem to which many or all of the identified problems are tied. The clinician must identify those problems that can be dealt with relatively easily. Quick resolution of one or more of these problems in the early phases of treatment can provide the client with a sense of accomplishment and mastery that will reinforce those early efforts, instill a sense of hope, and encourage continued efforts in working on more difficult problems. There may be clients who have a large number of problems, of which resolution of all of them in a timely manner may not be possible due to limitations imposed by the client’s payer, the probably of keeping the client engaged in treatment over an extended period of time, a planned relocation outside the local geographical area, the clients reluctance to work on all identified problems, or any of a number of other variables. The clinician should consider limiting the stated problem list to include only the more highly prioritized problems that can fully and effectively be treated under the imposed limitations of the specified program or payer. Doing this keeps the treatment plan grounded in reality and is consistent with setting realistic expectations for the client. Press ENTER for next slide. 25 Press ENTER for next slide. 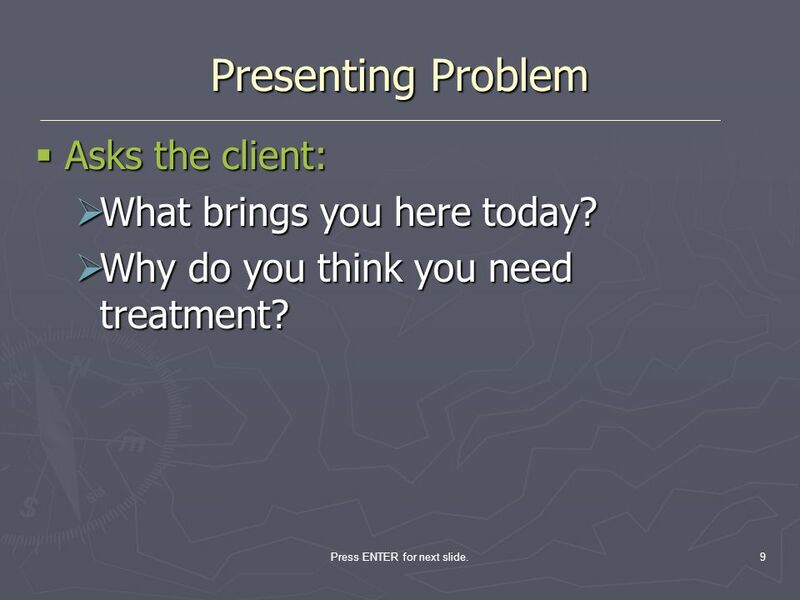 Presenting Problem Should contain a statement about the problem for which the client is seeking treatment. Clarification of how the problem is evidenced for this specific client. Identification of the symptoms that fit DSM-IV criteria Should always be documented in the client’s own words. 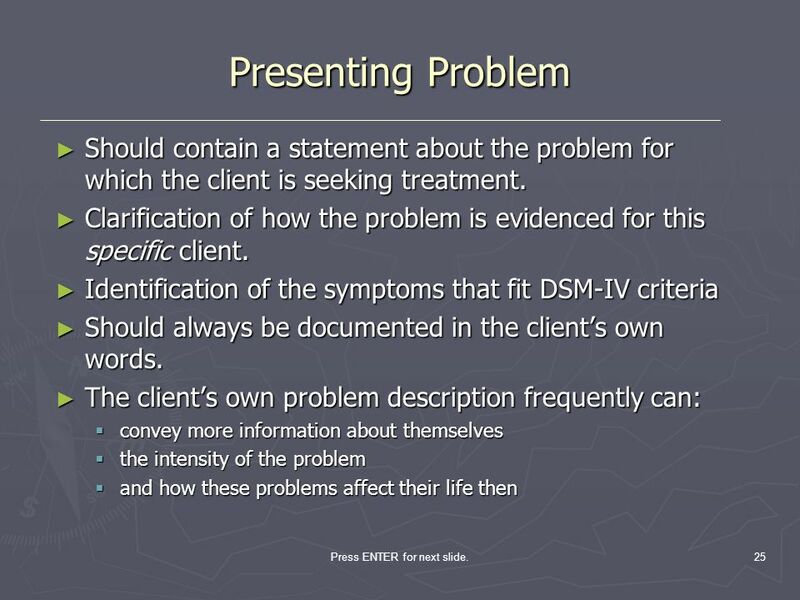 The client’s own problem description frequently can: convey more information about themselves the intensity of the problem and how these problems affect their life then clients should be able to identify one or more problems that they would like to work on in treatment. It may be necessary for the clinician to assist the client in verbalizing exactly what the problems are, based on the information obtained during the assessment. When this happens, the clinician should always seek the client’s validation of any interpretation of what they are trying to convey. In most instances, the source of the client’s referral to treatment will have one or more specific problems that the referring person / organization thinks require the attention of the behavioral healthcare professional. Frequently there will be problems that the clinician identifies that did not come from another source. These are problems that the clinician has noted and judged to be having a significant impact on the client’s functioning. Severe psychiatric symptomatology (e.g., hallucinations, delusions, clinical depression), substance abuse or dependence, extensive use of a particular defense mechanism (e.g., denial), and impaired marital functioning are a few examples of behaviors that clients or their referral sources may not be aware of as existing or as being problematic. It is important to remember that one of the purposes of the treatment plan is to serve as a vehicle for communicating with others. Thus, when the client’s statement is not sufficiently clear or informative, the therapist can always provide clarification of what the client actually meant to convey or what was implied in their response to the questions regarding the reason for treatment. Press ENTER for next slide. 26 Press ENTER for next slide. 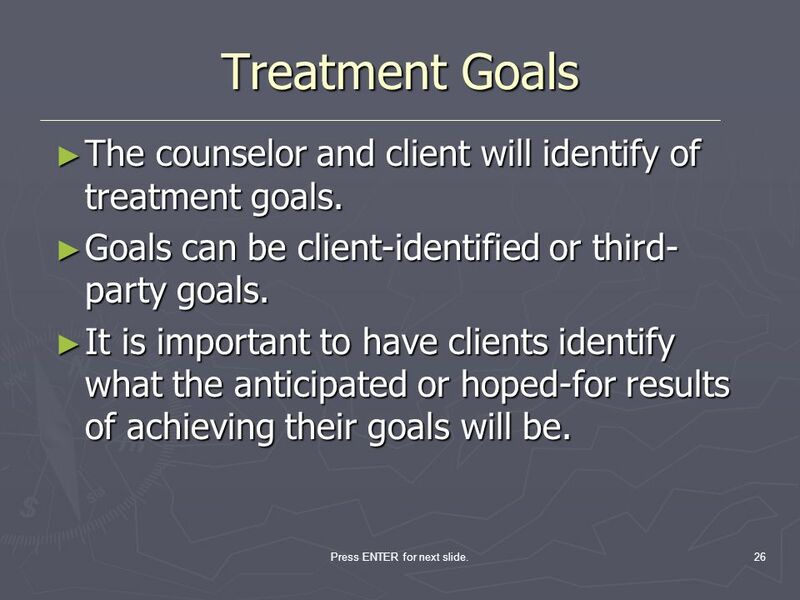 Treatment Goals The counselor and client will identify of treatment goals. Goals can be client-identified or third-party goals. It is important to have clients identify what the anticipated or hoped-for results of achieving their goals will be. After the assessment is complete the counselor and client will identify of treatment goals. In some cases, one or two goals might be identified, in others, several goals might be identified and prioritized by the importance and immediacy of the goal. Goals can be client-identified or third-party goals. To assist in clarifying and setting goals, it is important to have clients identify what the anticipated or hoped-for results of achieving their goals will be. Press ENTER for next slide. 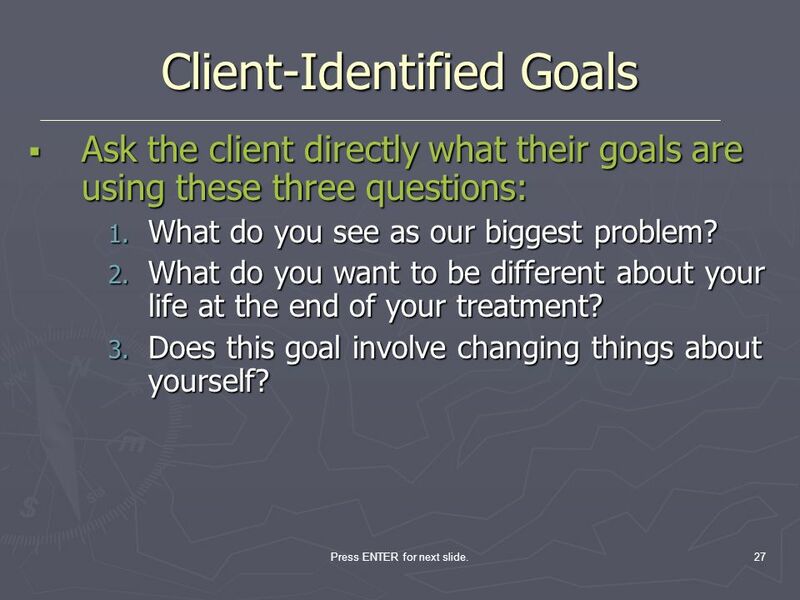 Ask the client directly what their goals are using these three questions: What do you see as our biggest problem? What do you want to be different about your life at the end of your treatment? Does this goal involve changing things about yourself? In most cases, these are the most obvious goals. It was the amelioration of the unwanted behavior or other symptoms that led the client to seek treatment, which is their goal. Directly ask the client directly what their goals are using these three questions: What do you see as our biggest problem? What do you want to be different about your life at the end of your treatment? Does this goal involve changing things about yourself? Press ENTER for next slide. Does this goal involve changing things about yourself? This question forces the client to think through their problems and realize the extent to which these problems have control over their thoughts, feelings, and behavior(s). It can provide a means for clients to gain insight into their problems – a therapeutic goal in and of itself. Does this goal involve changing things about yourself? This question forces the client to think through their problems and realize the extent to which these problems have control over their thoughts, feelings, and behavior(s). It can provide a means for clients to gain insight into their problems – a therapeutic goal in and of itself. Press ENTER for next slide. Ask clients the following questions relating to establishing objective outcome criteria for goal achievement: How will you know when things are different? What kinds of things will you be doing differently? What negative things will no longer be present? What positive things will you be doing? These questions offer clients an opportunity to gain insight into their problems. Clinician feedback can help clients see how realistic their expectations are for treatment and determine whether those expectations should be modified. 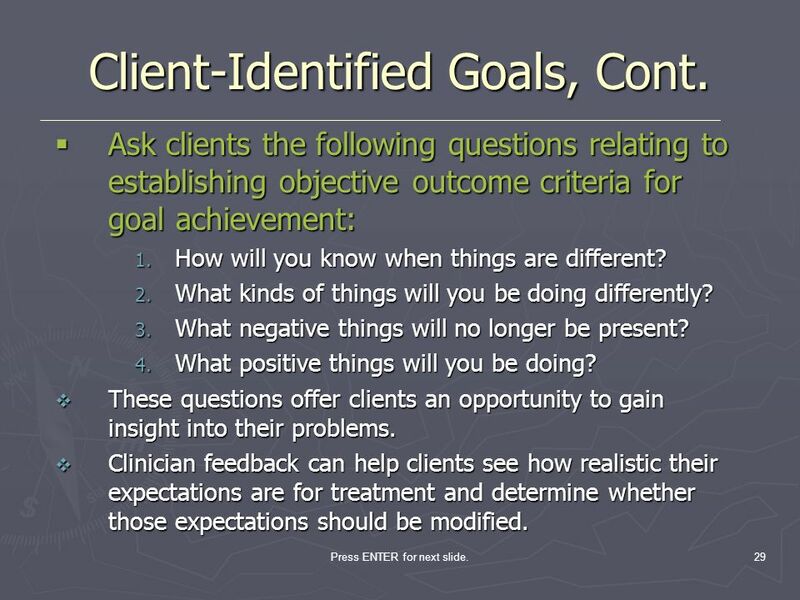 It is suggested that clinicians ask clients the following questions relating to establishing objective outcome criteria for goal achievement: How will you know when things are different? What kinds of things will you be doing differently? What negative things will no longer be present? What positive things will you be doing? These questions offer clients an opportunity to gain insight into their problems. Through clinician feedback clients can be helped to see how realistic their expectations are for treatment and determine whether those expectations should be modified. Press ENTER for next slide. 30 Press ENTER for next slide. 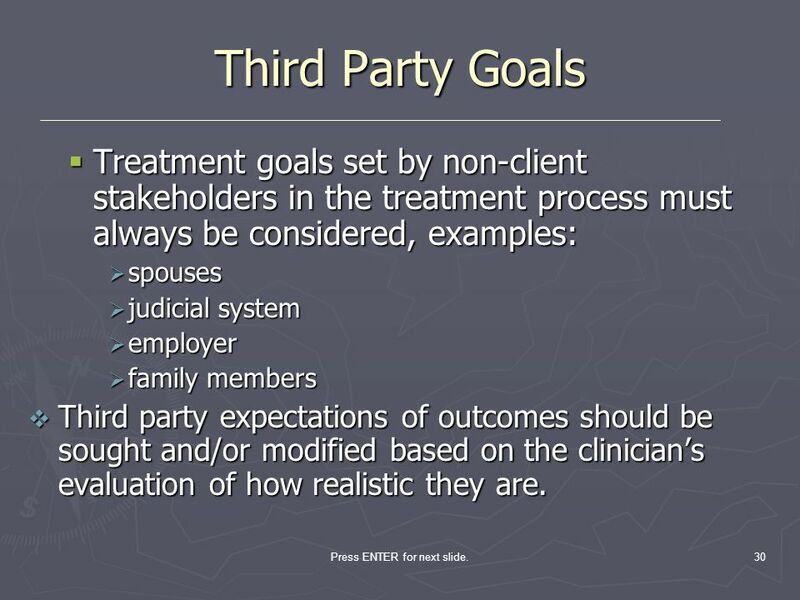 Third Party Goals Treatment goals set by non-client stakeholders in the treatment process must always be considered, examples: spouses judicial system employer family members Third party expectations of outcomes should be sought and/or modified based on the clinician’s evaluation of how realistic they are. 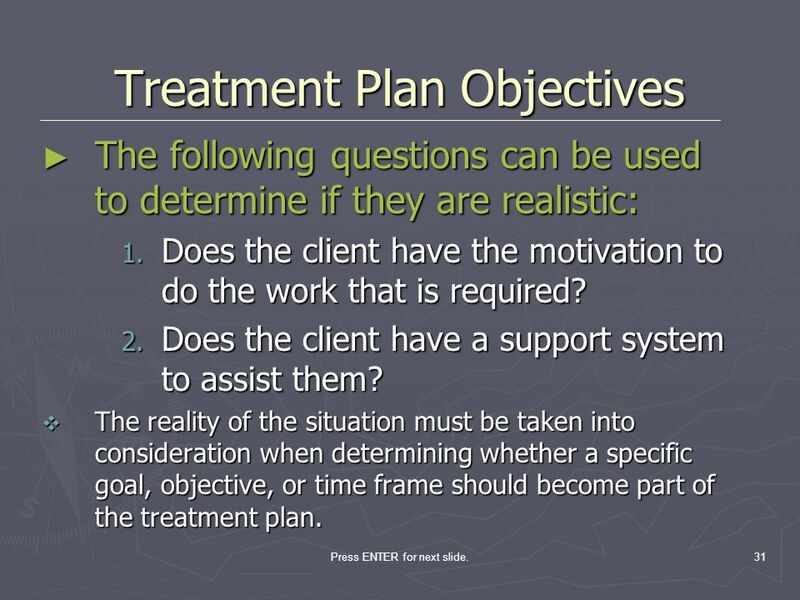 Treatment goals set by non-client stakeholders in the treatment process must always be considered, examples: spouses judicial system employer family members. the third parties expectations for the outcomes of goal achievement should be sought, and they may also be modified based on the clinician’s evaluation of how realistic they are. Press ENTER for next slide. The following questions can be used to determine if they are realistic: Does the client have the motivation to do the work that is required? Does the client have a support system to assist them? The reality of the situation must be taken into consideration when determining whether a specific goal, objective, or time frame should become part of the treatment plan. Once you have determined that the goals and objectives are achievable in a timely manner, the next question to ask yourself is how realistic that goal, objective or time frame is. The following questions can be used to determine if they are realistic: Does the client have the motivation to do the work that is required? Does the client have a support system to assist them? Regardless of the client’s ability to achieve the goal or objective in the time frame, the reality of the situation must be taken into consideration when determining whether a specific goal, objective, or time frame should become part of the treatment plan. Press ENTER for next slide. 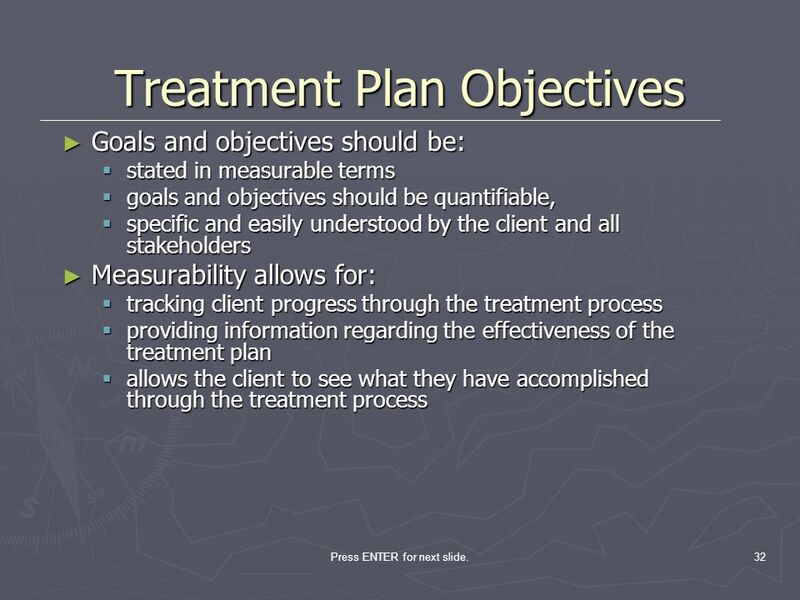 Goals and objectives should be: stated in measurable terms goals and objectives should be quantifiable, specific and easily understood by the client and all stakeholders Measurability allows for: tracking client progress through the treatment process providing information regarding the effectiveness of the treatment plan allows the client to see what they have accomplished through the treatment process Goals and objectives should be stated in measurable terms. In order to be measurable, goals and objectives should be quantifiable, specific and easily understood by the client and all stakeholders. Measurability allows for tracking client progress through the treatment process, providing information regarding the effectiveness of the treatment plan. Additionally, measurability allows the client to see for themselves where they started treatment and what they have accomplished through the treatment process, providing an incentive for continued participation in treatment. Press ENTER for next slide. 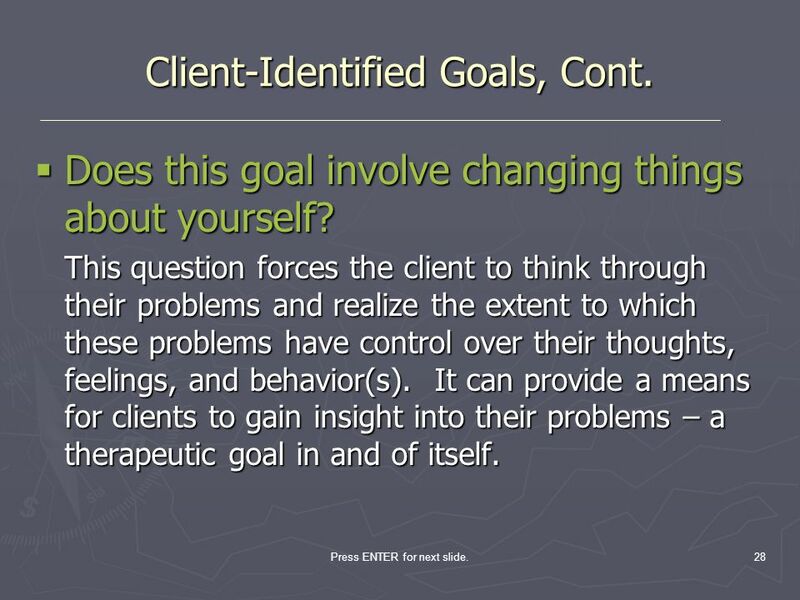 Goals should be stated in the positive (e.g., Increase the client’s level of self-esteem). Statements in the positive reinforce the idea that the client is striving to gain something rather than lose something. It is often difficult to attain a positive goal without eliminating or reducing one or more types of behaviors, emotions, or cognitions, it is appropriate to state objectives in the negative. Whenever possible, goals should be stated in the positive (e.g., Increase the client’s level of self-esteem). This conveys an effort to move towards improvement in the client’s life rather than a movement away from something that is having a negative effect. Statements in the positive reinforces the idea that the client is striving to gain something rather than lose something. It is often difficult to attain a positive goal without eliminating or reducing one or more types of behaviors, emotions, or cognitions, it is appropriate to state objectives in the negative. Press ENTER for next slide. The goals and objectives should be prioritized. The goals and objectives priority should mirror the priority assigned to the problems. The client can work toward achieving one or more goals at a time. 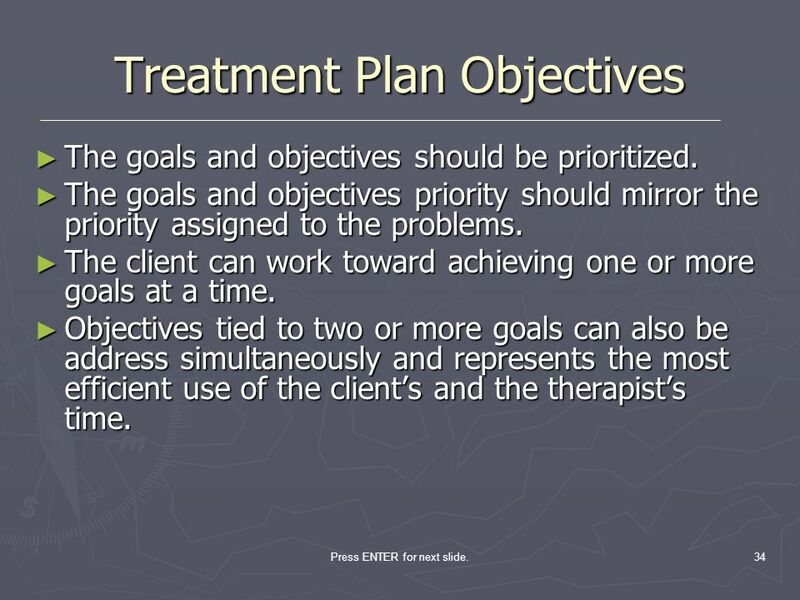 Objectives tied to two or more goals can also be address simultaneously and represents the most efficient use of the client’s and the therapist’s time. Just as it is important to prioritize the client’s problems, the goals and objectives should be prioritized. The priority should be given to the goals and objectives should mirror the priority assigned to the problems. Regardless of the various priority levels of the goals, the client can work toward achieving one or more goals at a time. Objectives tied to two or more goals can also be address simultaneously. Working on goals and objectives simultaneously represents the most efficient use of the client’s and the therapist’s time. Press ENTER for next slide. QUESTIONS TO ASK What do you see as your biggest problem? Do you think there is an immediate crisis that needs to be addressed? What do you see as your biggest goal in treatment? How will you know if you have achieved your goal? Does the goal involve changing things about yourself? Does the goal involve changing things about other people? What problems do you anticipate in reaching that goal? How will you be different after reaching the goal? What positive things will you be doing? What negative things will no longer be present? What skills will help you achieve the goal? QUESTIONS TO ASK What do you see as your biggest problem? Do you think there is an immediate crisis that needs to be addressed? What do you see as your biggest goal in treatment? How will you know if you have achieved your goal? Does the goal involve changing things about yourself? Does the goal involve changing things about other people? What problems do you anticipate in reaching that goal? How will you be different after reaching the goal? What positive things will you be doing? What negative things will no longer be present? What skills will help you achieve the goal? Press ENTER for next slide. 36 Press ENTER for next slide. Interventions The plan for how the therapist will assist the client in resolving their problems and consequently achieving their goals and objectives. 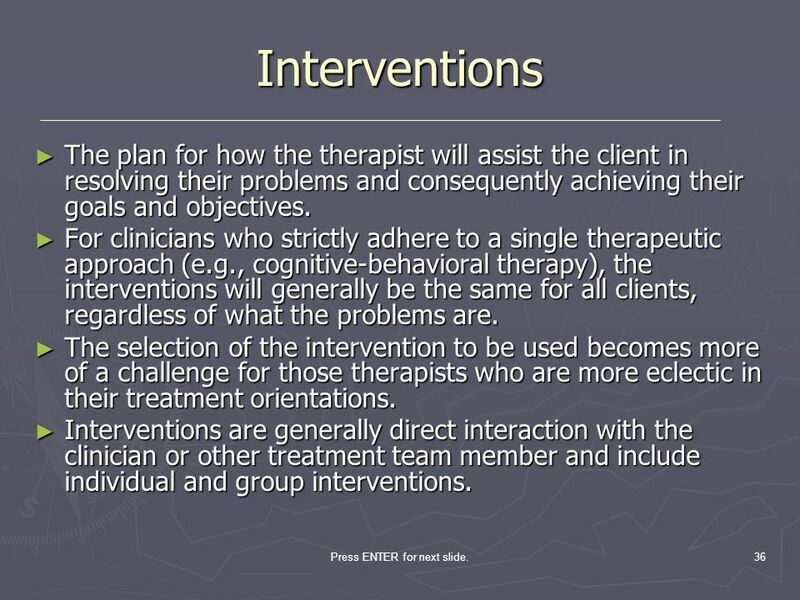 For clinicians who strictly adhere to a single therapeutic approach (e.g., cognitive-behavioral therapy), the interventions will generally be the same for all clients, regardless of what the problems are. The selection of the intervention to be used becomes more of a challenge for those therapists who are more eclectic in their treatment orientations. Interventions are generally direct interaction with the clinician or other treatment team member and include individual and group interventions. Following the listing of problems, goals, objectives and time frames is the plan for how the therapist will assist the client in resolving their problems and consequently achieving their goals and objectives. For clinicians who strictly adhere to a single therapeutic approach (e.g., cognitive-behavioral therapy), the interventions will generally be the same for all clients, regardless of what the problems are. The selection of the intervention to be used becomes more of a challenge for those therapists who are more eclectic in their treatment orientations. Interventions are generally direct interaction with the clinician or other treatment team member and include individual and group interventions. Press ENTER for next slide. 37 Press ENTER for next slide. 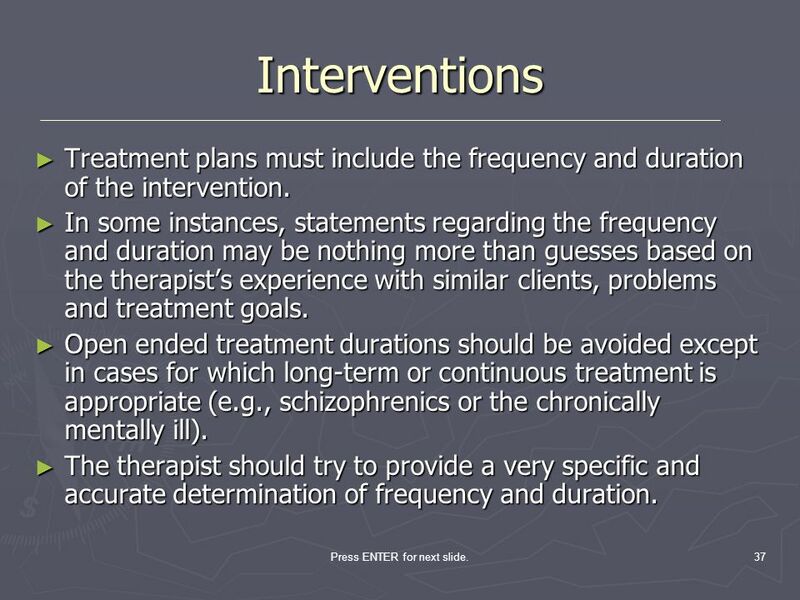 Interventions Treatment plans must include the frequency and duration of the intervention. In some instances, statements regarding the frequency and duration may be nothing more than guesses based on the therapist’s experience with similar clients, problems and treatment goals. Open ended treatment durations should be avoided except in cases for which long-term or continuous treatment is appropriate (e.g., schizophrenics or the chronically mentally ill). The therapist should try to provide a very specific and accurate determination of frequency and duration. Treatment plans must include the frequency and duration of the intervention. In some instances, statements regarding the frequency and duration may be nothing more than guesses based on the therapist’s experience with similar clients, problems and treatment goals. Generally, open ended treatment durations should be avoided except in cases for which long-term or continuous treatment is appropriate (e.g., schizophrenics or the chronically mentally ill). In most cases, the therapist should try to provide a very specific and accurate determination of frequency and duration. Press ENTER for next slide. 38 Press ENTER for next slide. Interventions QUESTIONS TO ASK Will the planned intervention enable to client to meet all or most of the documented goals and objectives? Does the treating therapist have the skills necessary for implementing the planned treatment intervention? Is what the client will be expected to do realistic? Is what the therapist will be expected to do realistic? Will the clinician be able to know within a reasonable amount of time if the intervention is working? Could a different type of intervention yield the same outcome? If so, why was it not selected? QUESTIONS TO ASK Will the planned intervention enable to client to meet all or most of the documented goals and objectives? Does the treating therapist have the skills necessary for implementing the planned treatment intervention? Is what the client will be expected to do realistic? Is what the therapist will be expected to do realistic? Will the clinician be able to know within a reasonable amount of time if the intervention is working? Could a different type of intervention yield the same outcome? If so, why was it not selected? Press ENTER for next slide. No treatment plan would be complete without an indication of the criteria for successful discharge from treatment. Must include the Texas Department of Insurance Criteria for discharge from that level of care. The therapist and client must have an agreed upon point at which treatment or a portion of treatment is considered complete and the services being offered to the client are terminated or transferred to a more appropriate LOC. The criteria should be objective and measurable and should reflect the stated goals and objectives. 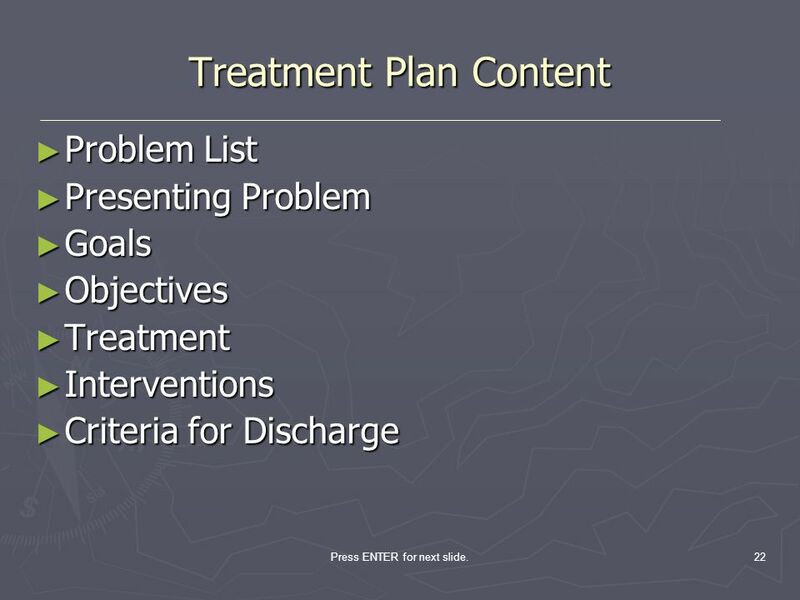 No treatment plan would be complete without an indication of the criteria for successful discharge from treatment. 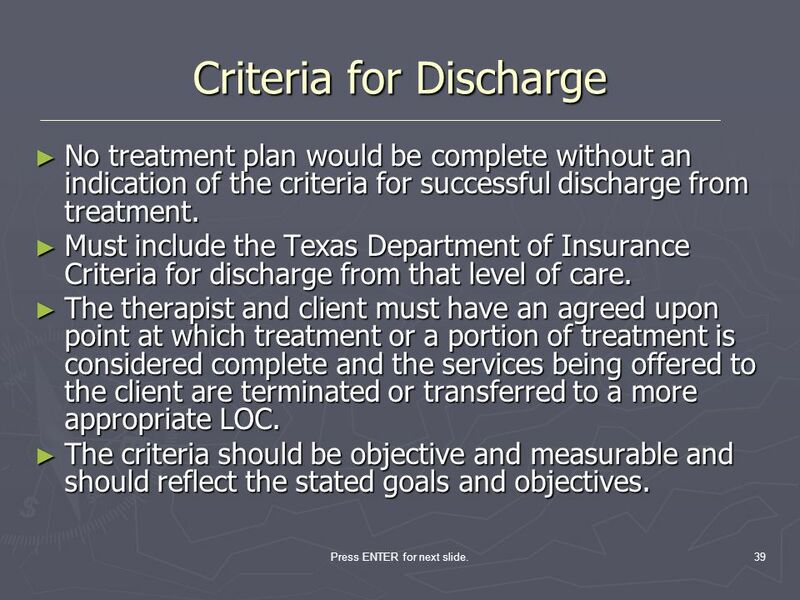 The criteria must include the Texas Department of Insurance Criteria for discharge from that level of care. Both the therapist and client must have an agreed upon point at which treatment or a portion of treatment is considered complete and the services being offered to the client are terminated or transferred to a more appropriate LOC. The criteria should be objective and measurable and should reflect the stated goals and objectives. 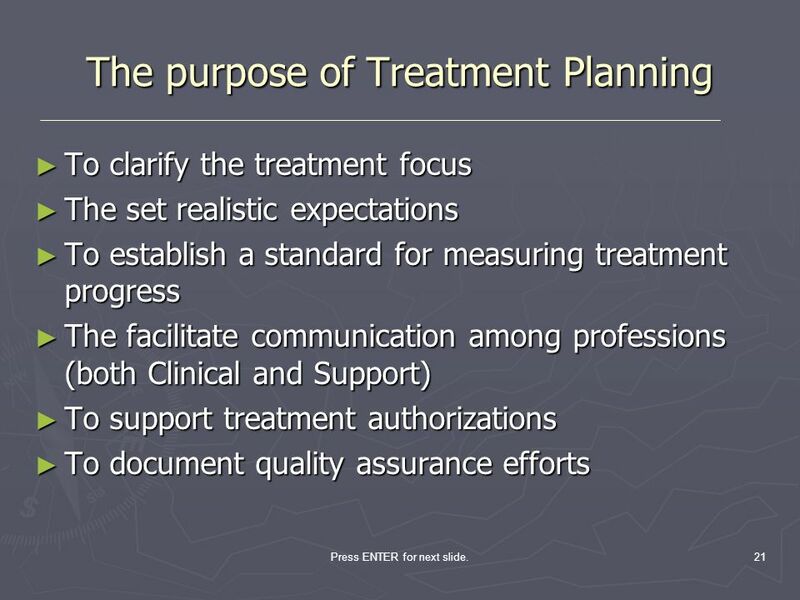 Vague, unspecified, or no criteria can lead to the provision of treatment with no clearly defined end point, a circumstance that can result in unfocused therapeutic efforts that leads one to question the goals of treatment. Press ENTER for next slide. 40 Press ENTER for next slide. 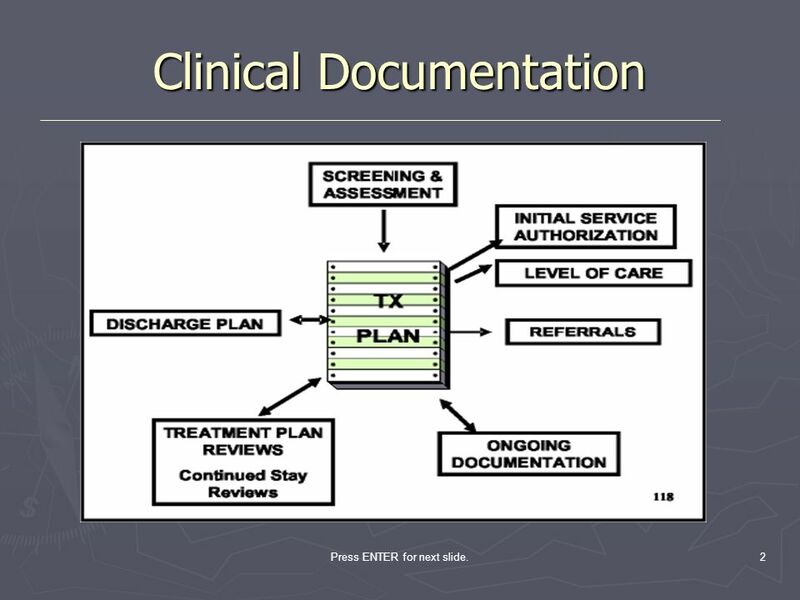 Treatment Plan Review There should always be a time indicated for treatment plan review. For residential clients, the treatment plan should be reviewed and updated every 14 days, sooner if there is a significant change in the client’s condition. For outpatient clients, the review should occur every 30 days or sooner if there is a significant change in the client’s condition. 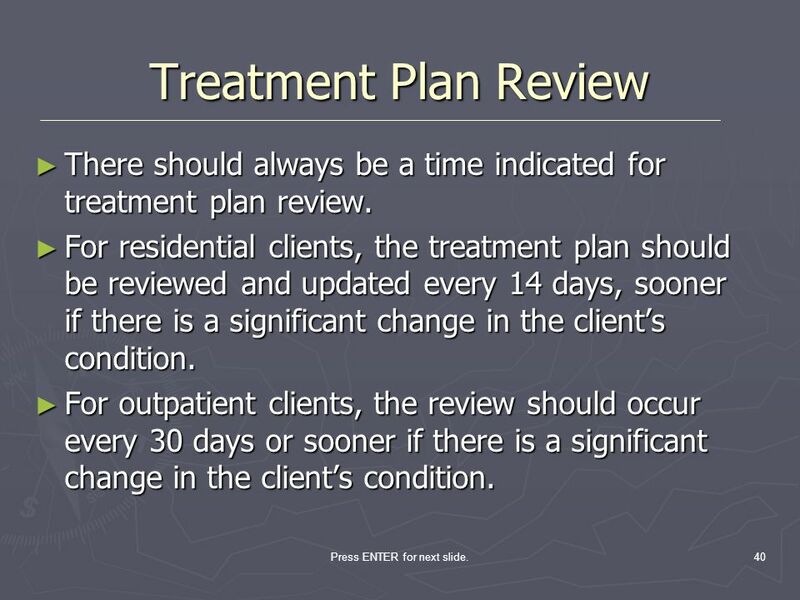 There should always be a time indicated for treatment plan review. For residential clients, the treatment plan should be reviewed and updated every 14 days, sooner if there is a significant change in the client’s condition. For outpatient clients, the review should occur every 30 days or sooner if there is a significant change in the client’s condition. Press ENTER for next slide. 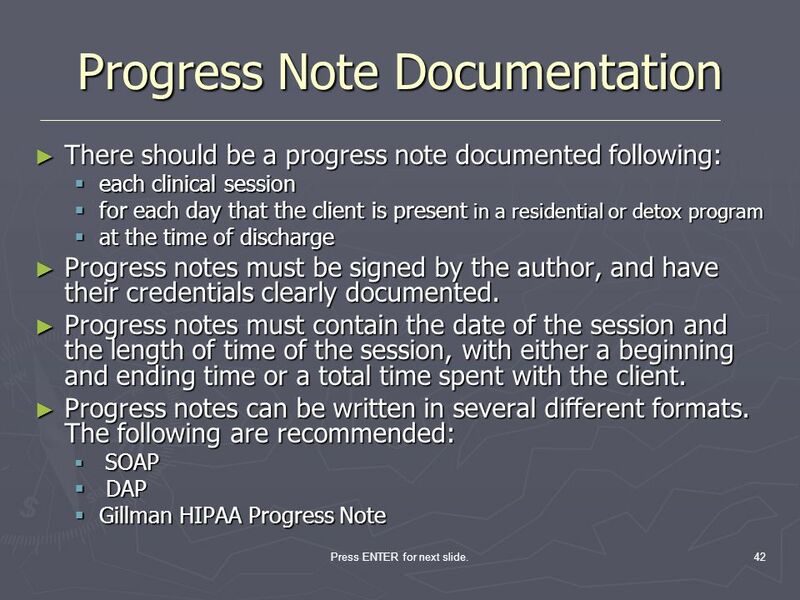 There should be a progress note documented following: each clinical session for each day that the client is present in a residential or detox program at the time of discharge Progress notes must be signed by the author, and have their credentials clearly documented. Progress notes must contain the date of the session and the length of time of the session, with either a beginning and ending time or a total time spent with the client. Progress notes can be written in several different formats. The following are recommended: SOAP DAP Gillman HIPAA Progress Note There should be a progress note documented following each clinical session, for each day that the client is present in a residential or detox program, and at the time of discharge. 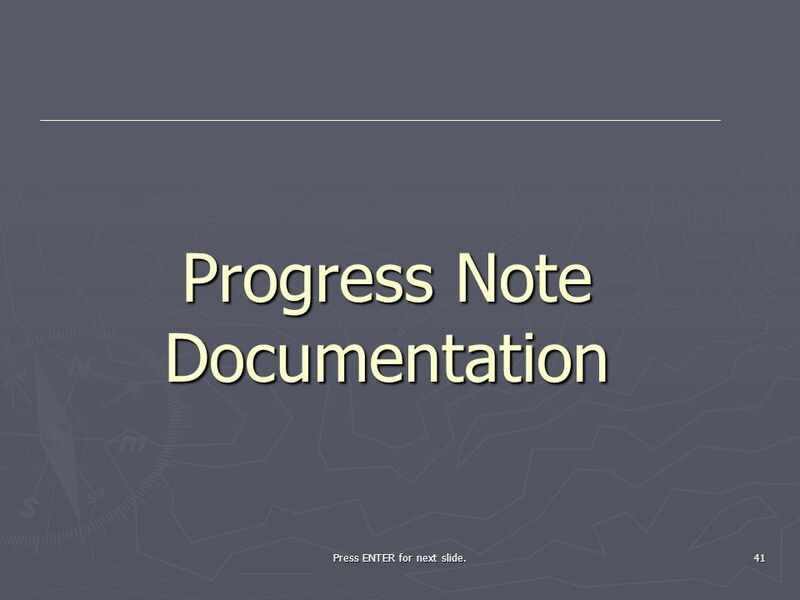 Progress notes must be signed by the author, and have their credentials clearly documented. Progress notes must contain the date of the session and the length of time of the session, with either a beginning and ending time or a total time spent with the client. 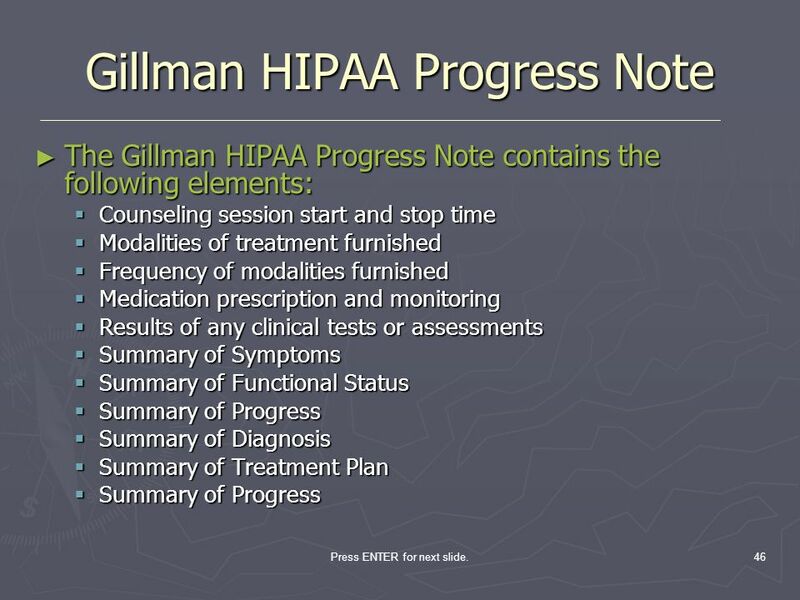 Progress notes can be written in several different formats, three discussed here are the SOAP, the DAP and the Gillman HIPAA Progress Note. Press ENTER for next slide. 43 Press ENTER for next slide. S.O.A.P. Notes S = Subjective [client’s view of problems or progress noted, use client’s own words.] 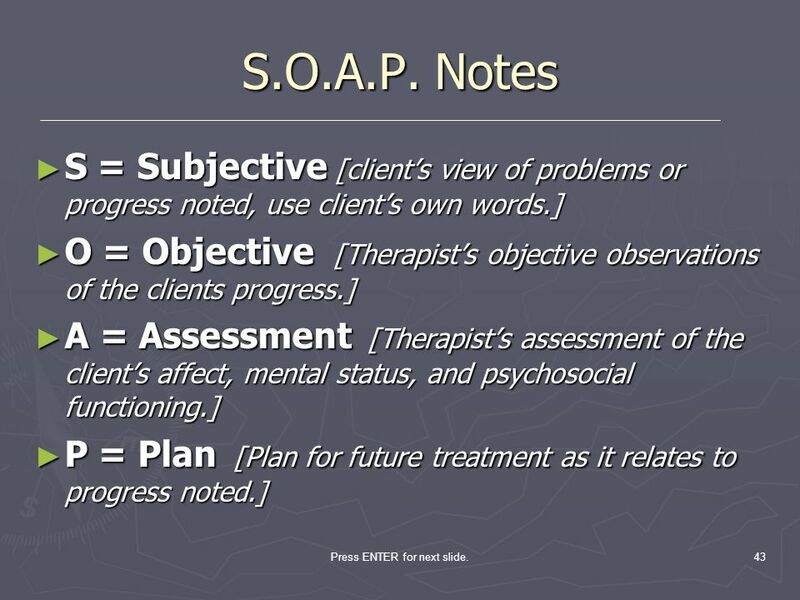 O = Objective [Therapist’s objective observations of the clients progress.] A = Assessment [Therapist’s assessment of the client’s affect, mental status, and psychosocial functioning.] P = Plan [Plan for future treatment as it relates to progress noted.] S = Subjective [client’s view of problems or progress noted, use client’s own words.] 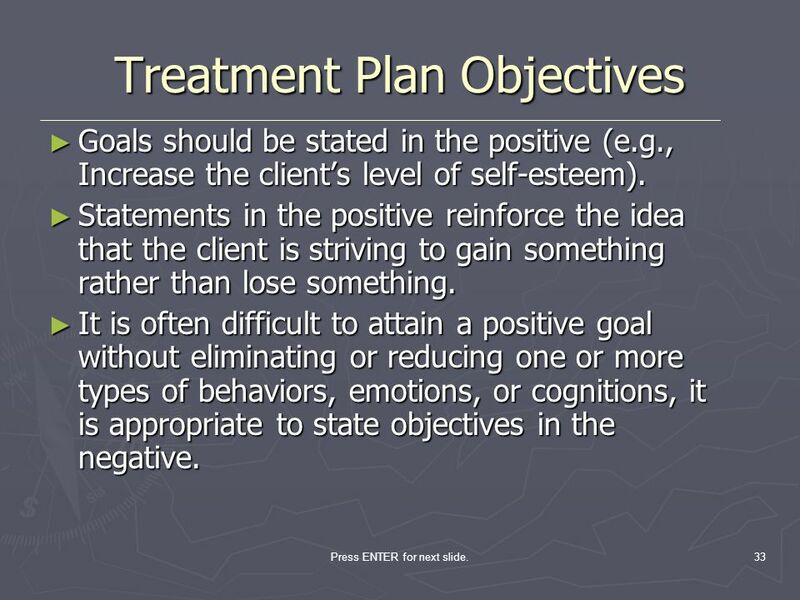 O = Objective [Therapist’s objective observations of the clients progress.] 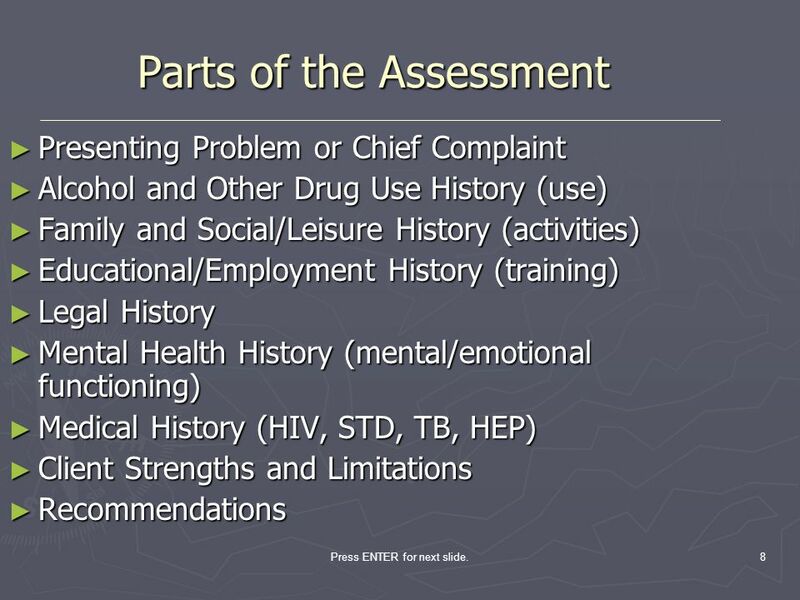 A = Assessment [Therapist’s assessment of the client’s affect, mental status, and psychosocial functioning.] P = Plan [Plan for future treatment as it relates to progress noted.] Press ENTER for next slide. 44 Press ENTER for next slide. D.A.P. Notes D = Data [Therapist’s observations, what the clinician saw and heard, quote statements made by the client.] A = Assessment [The therapists assessment of the client’s mental status and psychological functioning.] P = Plan [Plan for future treatment as it relates to progress noted and updating of the treatment plan.] 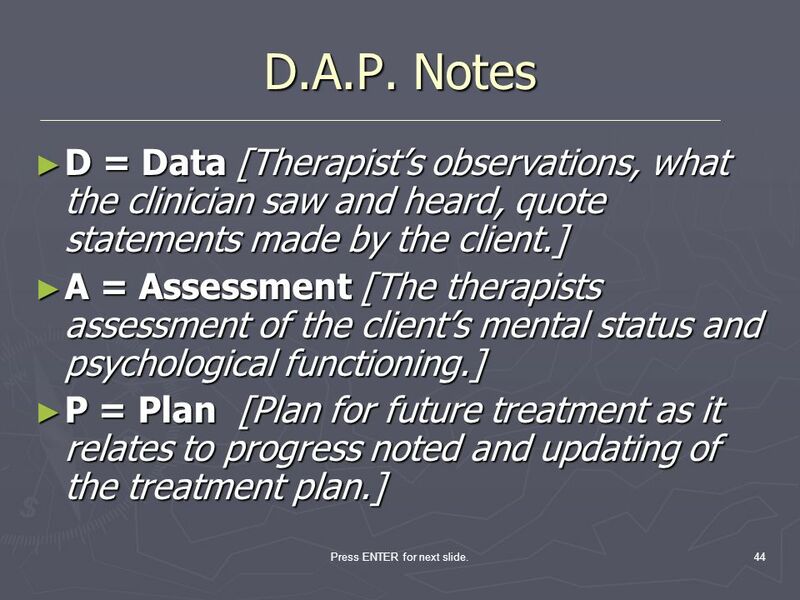 D = Data [Therapist’s observations, what the clinician saw and heard, quote statements made by the client.] A = Assessment [The therapists assessment of the client’s mental status and psychological functioning.] P = Plan [Plan for future treatment as it relates to progress noted and updating of the treatment plan.] Press ENTER for next slide. This is a new system used to document behavioral therapy notes Created by Peter B. Gillman, PhD, Response to the HIPAA regulations around psychotherapy notes. 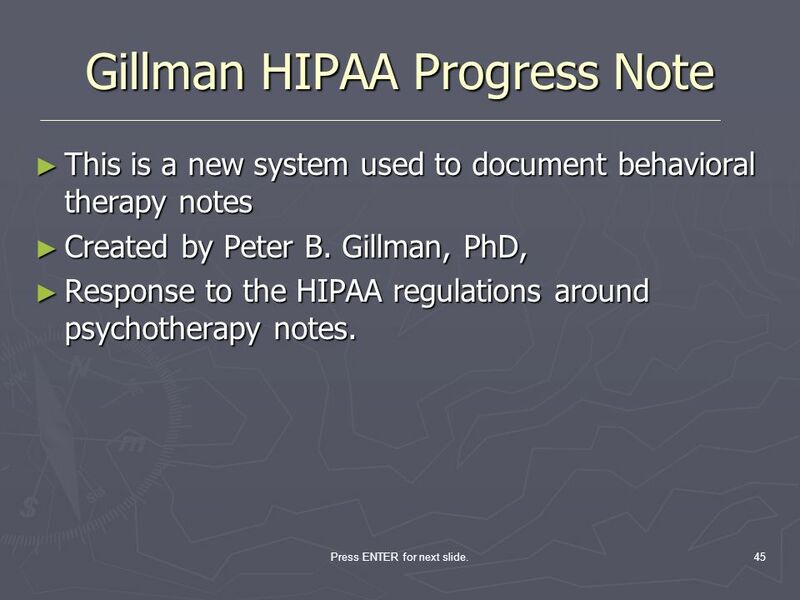 This is a new system used to document behavioral therapy notes created by Peter B. Gillman, PhD, in response to the HIPAA regulations around psychotherapy notes. The Gillman HIPAA Progress Note contains the following elements: Counseling session start and stop time Modalities of treatment furnished Frequency of modalities furnished Medication prescription and monitoring Results of any clinical tests or assessments Summary of Symptoms Summary of Functional Status Summary of Progress Summary of Diagnosis Summary of Treatment Plan Press ENTER for next slide. The Gillman HIPAA Progress Note contains the following elements: Counseling session start and stop time Modalities of treatment furnished Frequency of modalities furnished Medication prescription and monitoring Results of any clinical tests or assessments Summary of Symptoms Summary of Functional Status Summary of Progress Summary of Diagnosis Summary of Treatment Plan This is a new system used to document behavioral therapy notes created by Peter B. Gillman, PhD, in response to the HIPAA regulations around psychotherapy notes. The Gillman HIPAA Progress Note contains the following elements: Counseling session start and stop time Modalities of treatment furnished Frequency of modalities furnished Medication prescription and monitoring Results of any clinical tests or assessments Summary of Symptoms Summary of Functional Status Summary of Progress Summary of Diagnosis Summary of Treatment Plan Press ENTER for next slide. 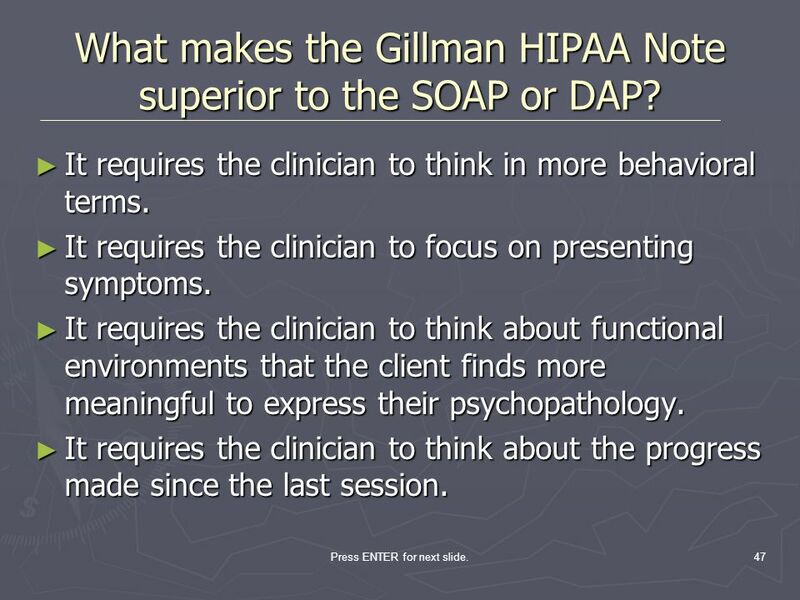 47 What makes the Gillman HIPAA Note superior to the SOAP or DAP? It requires the clinician to think in more behavioral terms. It requires the clinician to focus on presenting symptoms. It requires the clinician to think about functional environments that the client finds more meaningful to express their psychopathology. It requires the clinician to think about the progress made since the last session. It requires the clinician to think in more behavioral terms. It requires the clinician to focus on presenting symptoms. It requires the clinician to think about functional environments that the client finds more meaningful to express their psychopathology. It requires the clinician to think about the progress made since the last session. Press ENTER for next slide. 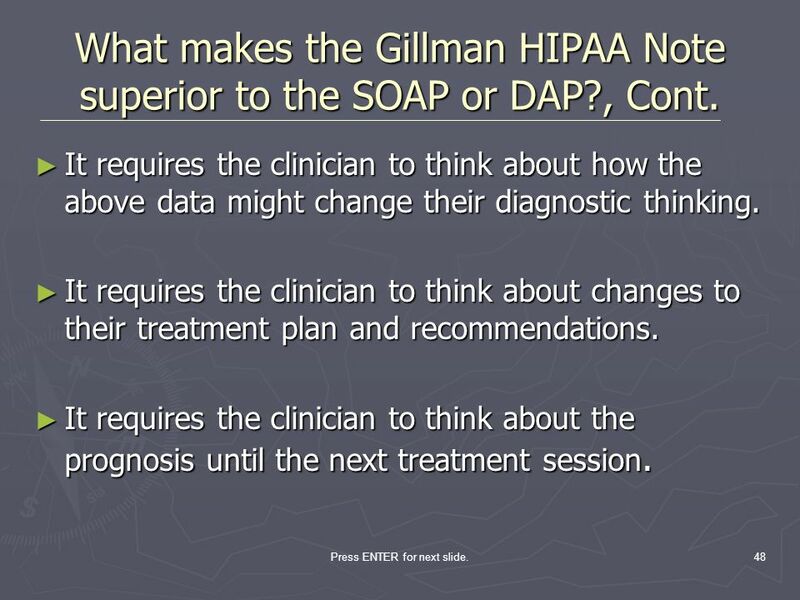 48 What makes the Gillman HIPAA Note superior to the SOAP or DAP?, Cont. It requires the clinician to think about how the above data might change their diagnostic thinking. It requires the clinician to think about changes to their treatment plan and recommendations. It requires the clinician to think about the prognosis until the next treatment session. It requires the clinician to think about how the above data might change their diagnostic thinking. It requires the clinician to think about changes to their treatment plan and recommendations. It requires the clinician to think about the prognosis until the next treatment session. Press ENTER for next slide. Think about what you will write before you write it. Sign and Date every note. 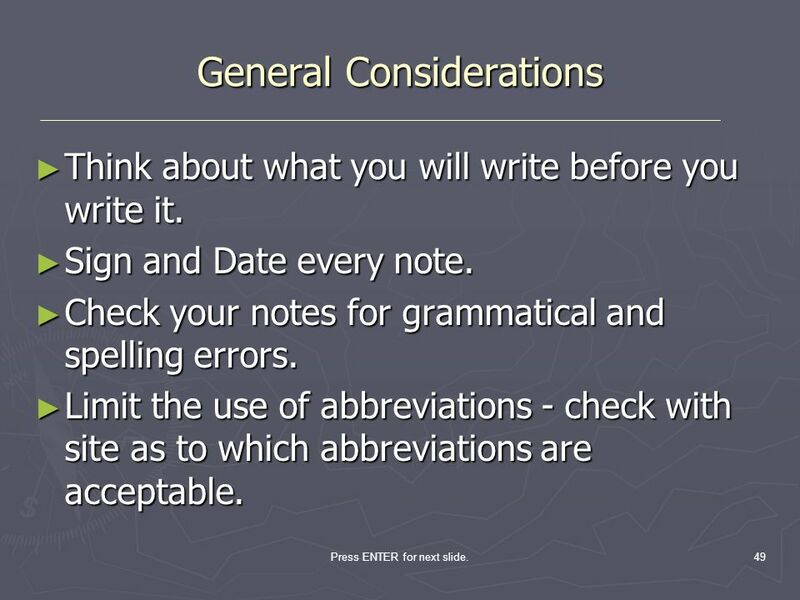 Check your notes for grammatical and spelling errors. Limit the use of abbreviations - check with site as to which abbreviations are acceptable. Think about what you will write before you write it. Sign and Date every note. Check your notes for grammatical and spelling errors. Limit the use of abbreviations - check with site as to which abbreviations are acceptable. Press ENTER for next slide. Errors on hand written notes should have a single line through them, write 'error', initial, and date. Write legibly. Avoid blank spaces between entries. Include client name and case number on each page. Use direct quotations when reporting clinically relevant client quotations. 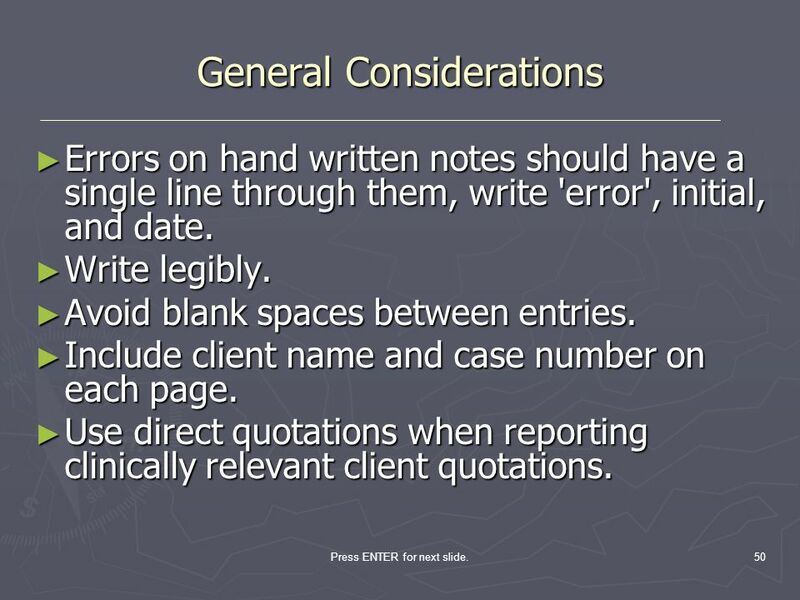 If notes are hand written, errors should have a single line through them, write 'error', initial, and date. Write legibly. Avoid blank spaces between entries. Include client name and case number on each page. Use direct quotations when reporting clinically relevant client quotations. Press ENTER for next slide. Describe what was observed not just your opinion about what was observed. 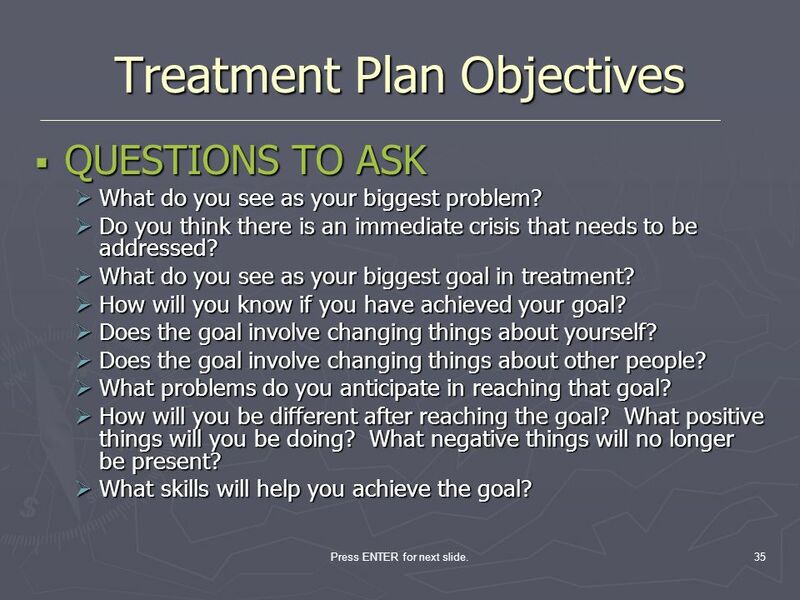 Tie notes into your treatment plan goals and objectives. Be as brief as is necessary - that is put enough information down to complete a note well, but don't put more information than is necessary. Clearly note any risk assessment data and contracting. Describe what was observed not just your opinion about what was observed. 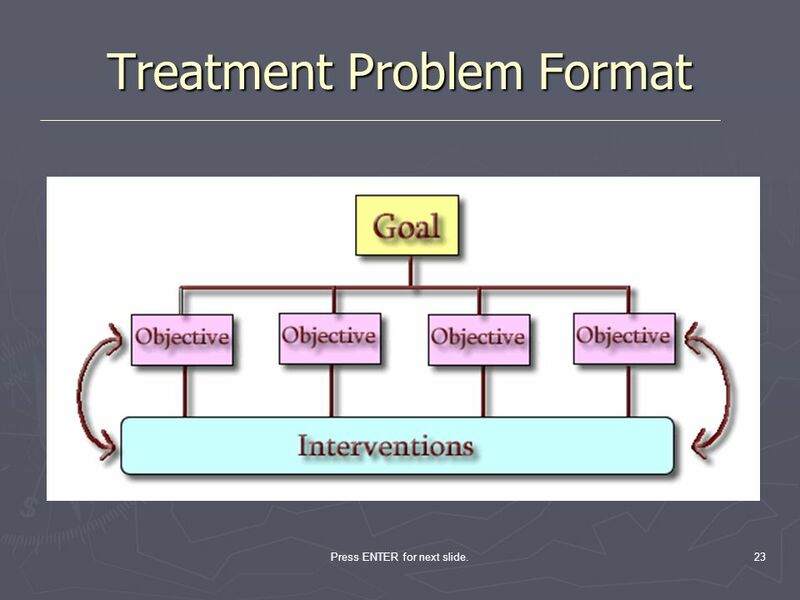 Tie notes into your treatment plan goals and objectives. Be as brief as is necessary - that is put enough information down to complete a note well, but don't put more information than is necessary. 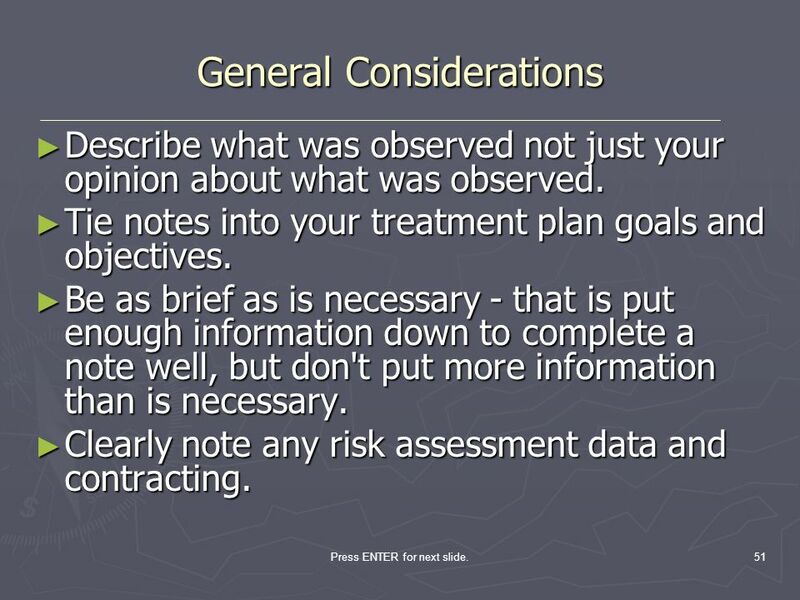 Clearly note any risk assessment data and contracting. Press ENTER for next slide. Remember the chart is a legal document. 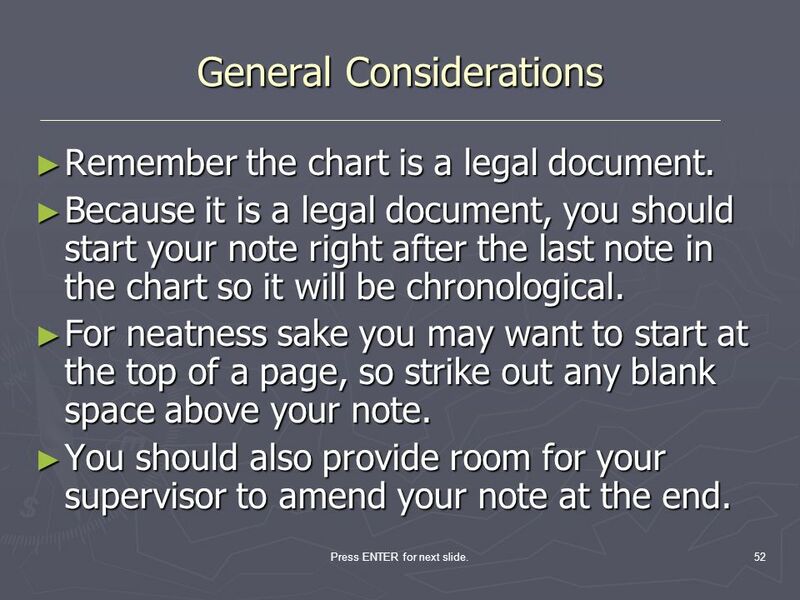 Because it is a legal document, you should start your note right after the last note in the chart so it will be chronological. For neatness sake you may want to start at the top of a page, so strike out any blank space above your note. You should also provide room for your supervisor to amend your note at the end. Always keep in mind that the chart is a legal document. Because it is a legal document, you should start your note right after the last note in the chart so it will be chronological. For neatness sake you may want to start at the top of a page, so strike out any blank space above your note. You should also provide room for your supervisor to amend your note at the end. Press ENTER for next slide. Do not leave blank lines in between text. If you make a mistake, simply cross out the word with a single horizontal line, write “error”, and initial it. Do not scribble/white out a mistake. While writing your note, do not leave blank lines in between text. This is to prevent someone else from writing in your note which could be bad for legal reasons. 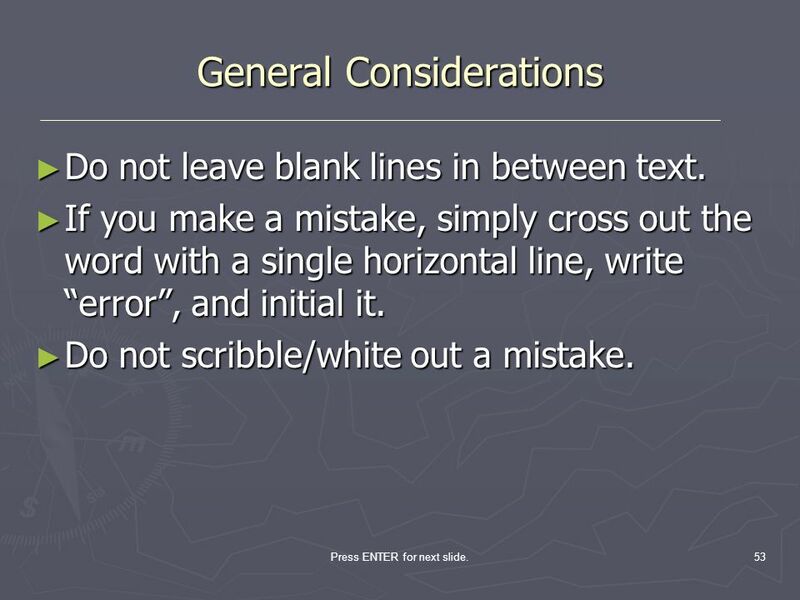 Similarly, if you make a mistake, simply cross out the word with a single horizontal line, write “error”, and initial it. Do not scribble/white out a mistake. Press ENTER for next slide.